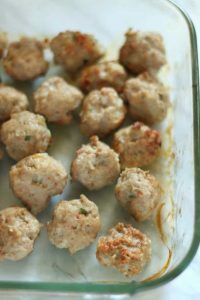 This Easy Gluten Free & Keto Fathead Stuffing is the Perfect Low Carb Side Dish for the Holidays!!! 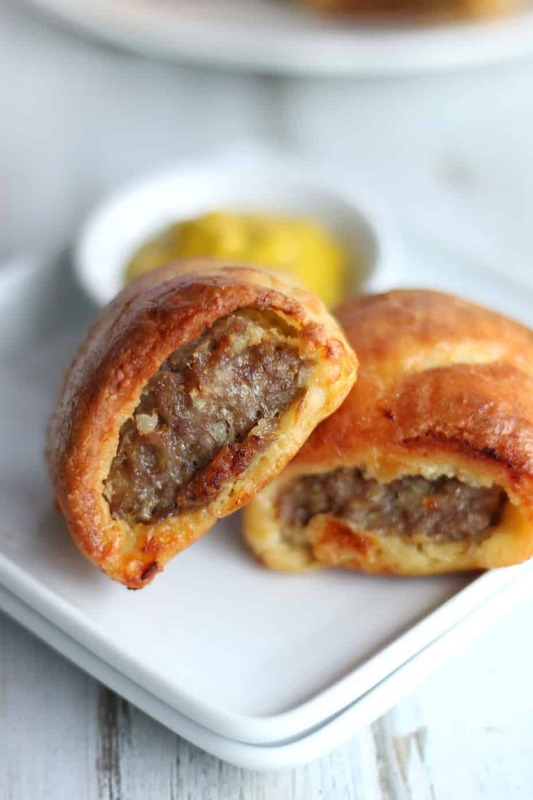 It Tastes Just Like Traditional Bread Stuffing But Is Made With a Mozzarella Cheese Based Dough. It’s an Easy To Make Dough That’s So Versatile. 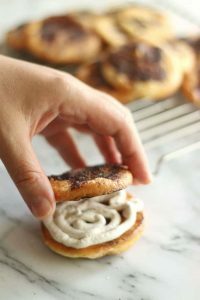 If you haven’t Tried Fathead Dough Yet, You’ve Been Missing Out! It’s Amazing!!! It Makes an Awesome Keto Pizza Crust , Fathead Nacho Chips or can be used to Make Tasty Keto Pumpkin Cinnamon Rolls. 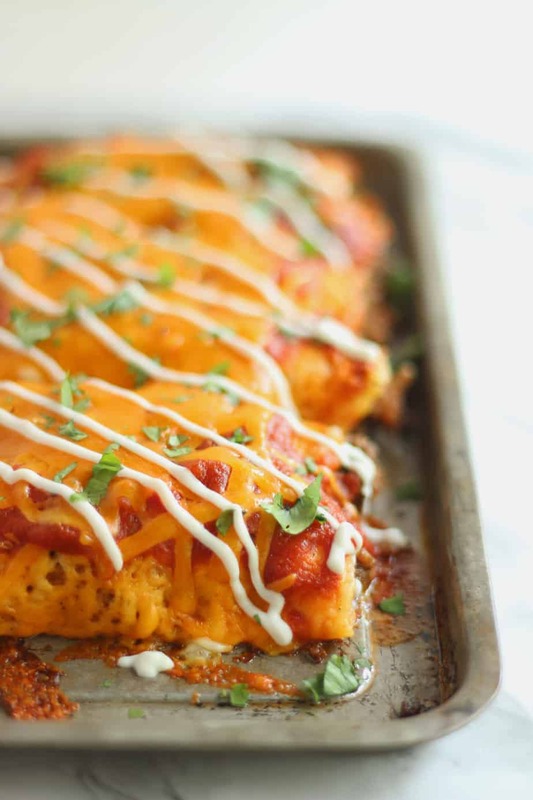 To make this delicious keto fathead stuffing, you melt the shredded mozzarella and the cream cheese in a frying pan over medium heat. 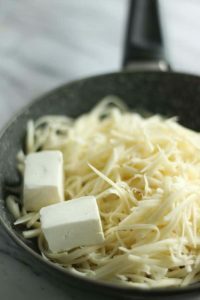 (This step can also be done in a microwave) Remove from the heat, then stir the melted cheeses until they’re well combined. 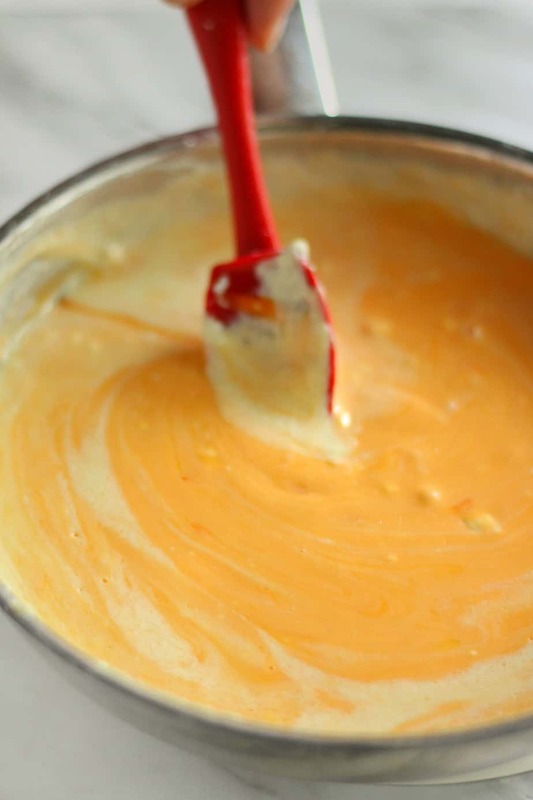 Using a mixing bowl, add the almond flour, coconut flour, baking powder, xanthan gum and eggs to the cheese mixture. Mix until well combined. 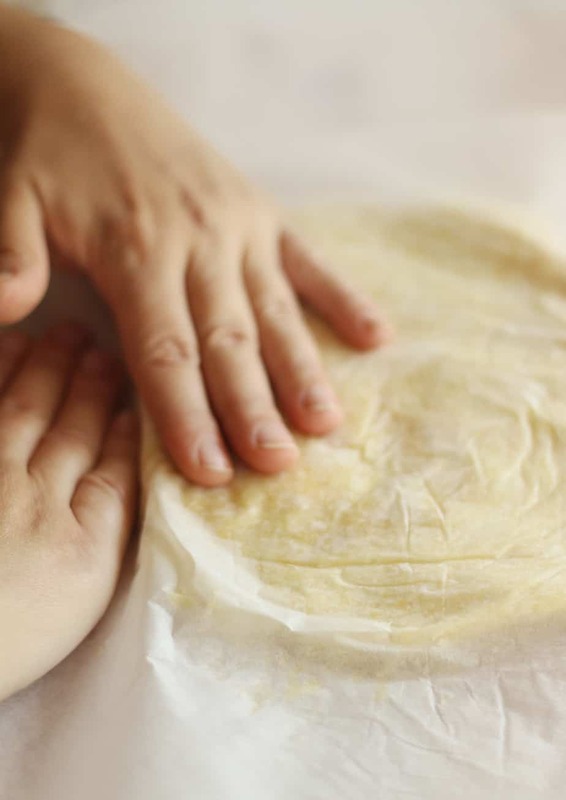 Between 2 pieces of parchment paper, press the dough into a rectangle. Remove the top piece of parchment paper, then brush the top with the melted butter. In a small bowl combine the garlic and onion powder with the basil. Sprinkle it over the spread out dough. 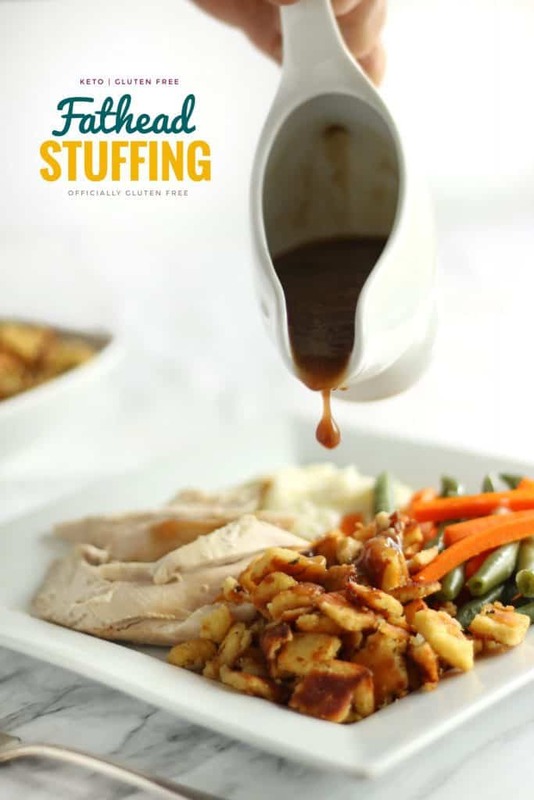 Bake the low carb stuffing for 10 minutes. 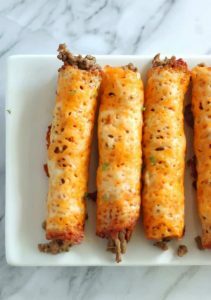 Remove the keto stuffing from the oven, then cut into small 1/2 inch squares. 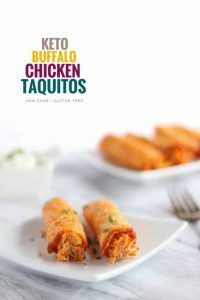 Place the the squares into a mixing bowl, then add the minced onion and celery. Add 1/2 a cup of the drippings or broth and mix until very well combined. Bake for 10 minutes, then stir and add the remaining drippings. Bake for another 10 – 15 minutes, stirring a few more times throughout. 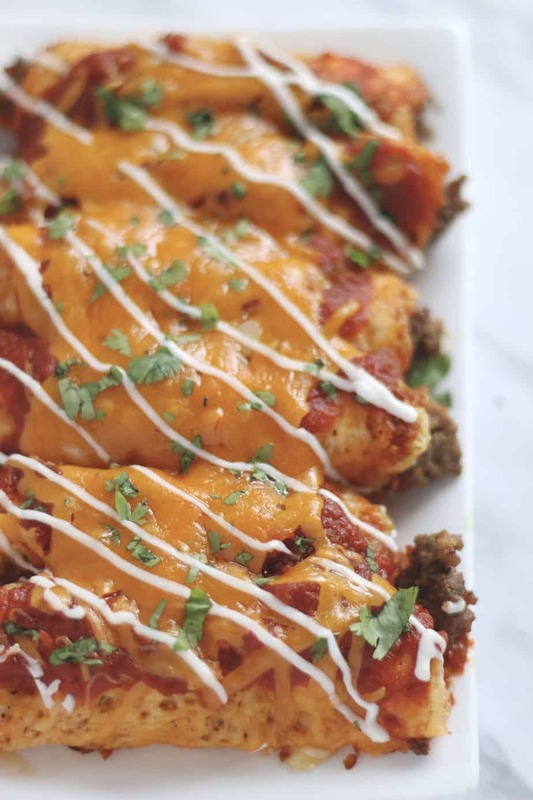 This Keto Fathead Stuffing tastes just like traditional stuffing. 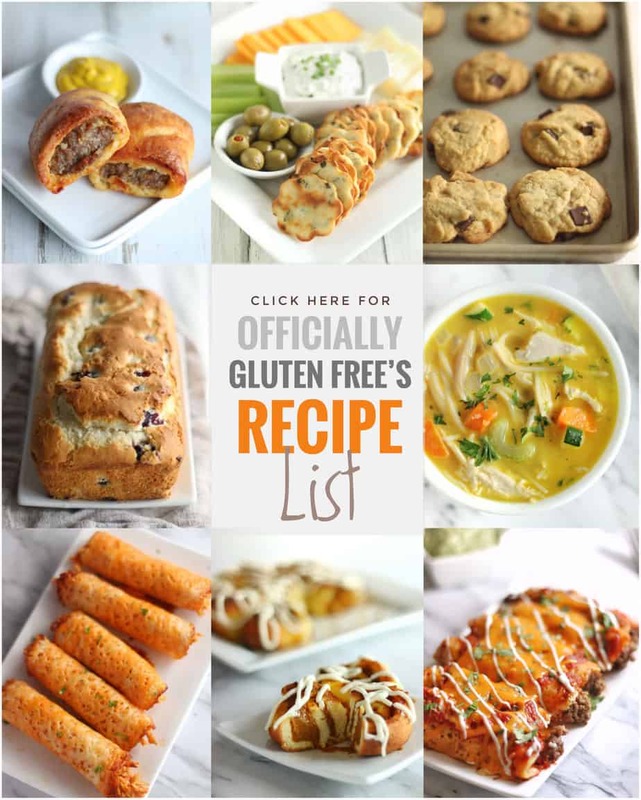 The dough is really easy to make and can be thrown together in a few minutes. 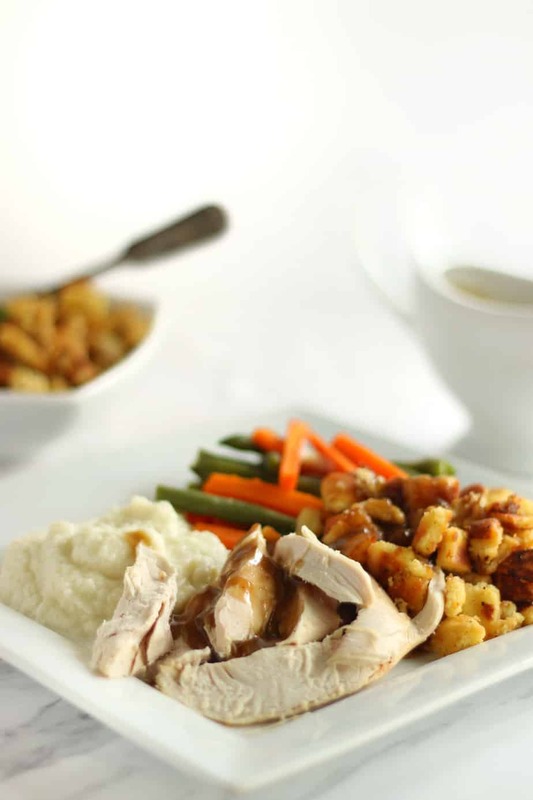 It’s so Good… You’d Never Even Know it’s Low Carb Stuffing. 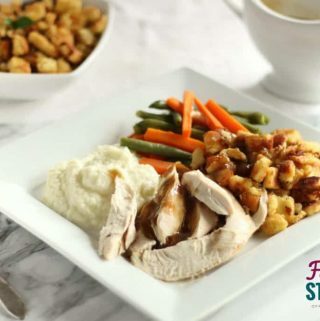 I like to serve my Keto Stuffing with a side of Cauliflower Mash, Steamed Low Carb Veggies, Keto Gravy and of Course a Delicious Roast Turkey or Chicken. 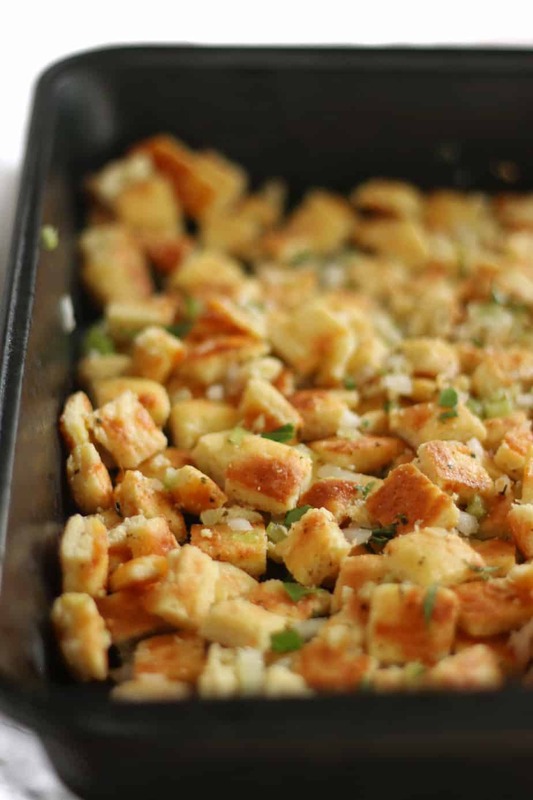 I like to Make my Keto Stuffing Made in a Pan, Rather then Stuffing it into the Turkey. It’s just personal preference. I prefer it to be on the drier side. 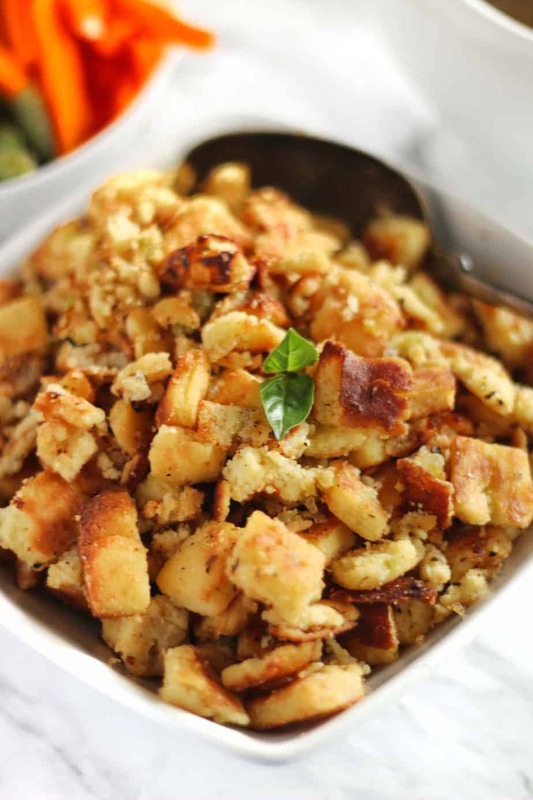 This Stuffing can be stuffed in the turkey as well but will make a more for a more moist consistency. 2. 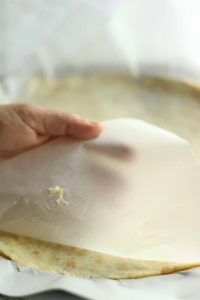 Between 2 pieces of parchment paper, press the dough into a rectangle. 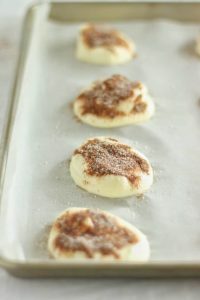 Remove the top piece of parchment paper, then brush the top with the melted butter. In a small bowl combine the garlic and onion powder with the basil. Sprinkle it over the spread out dough. Bake for 10 minutes. 3. 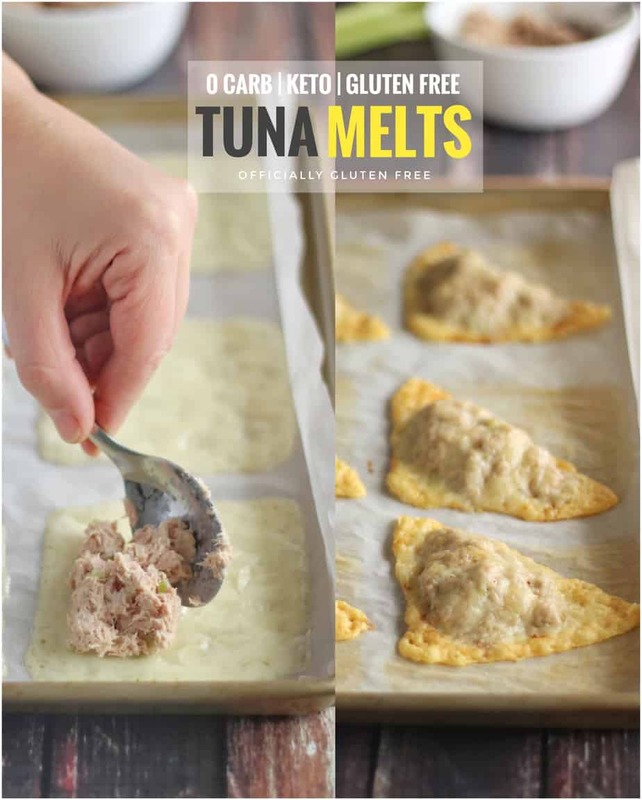 Remove the Keto Stuffing from the oven, then cut into small 1/2 inch squares. Place the the squares into a mixing bowl, then add the minced onion and celery. Add 1/2 a cup of the drippings or broth and mix until very well combined. Bake for 10 minutes, then stir and add the remaining drippings. Bake for another 10 – 15 minutes, stirring a few more times throughout. 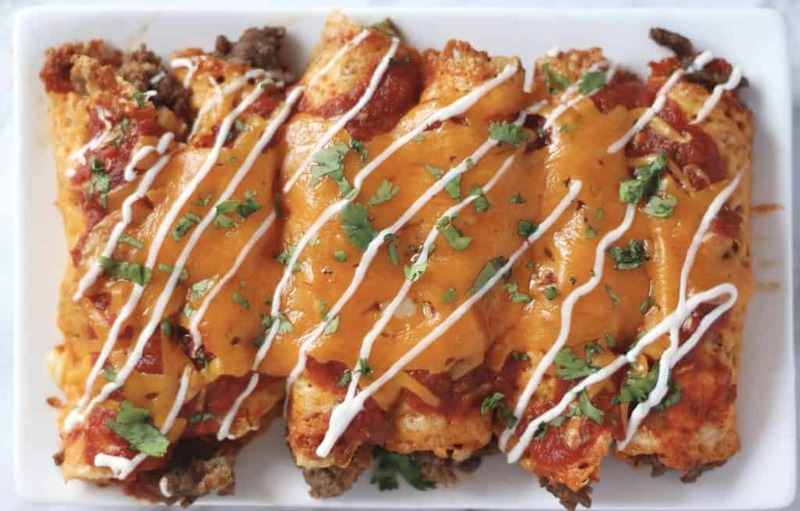 This Keto Fathead Stuffing Recipe Serves 6 people. 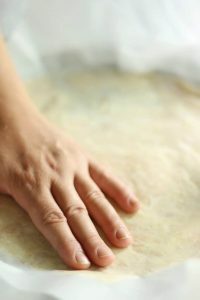 Between 2 pieces of parchment paper, press the dough into a rectangle. 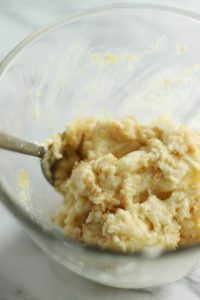 Remove the top piece of parchment paper, then brush the top with the melted butter. In a small bowl combine the garlic and onion powder with the basil. Sprinkle it over the spread out dough. Bake 10 minutes. 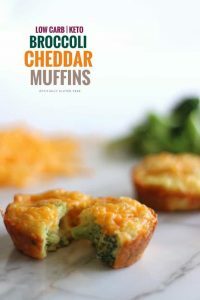 Remove from the oven, then cut into small ½ inch squares. 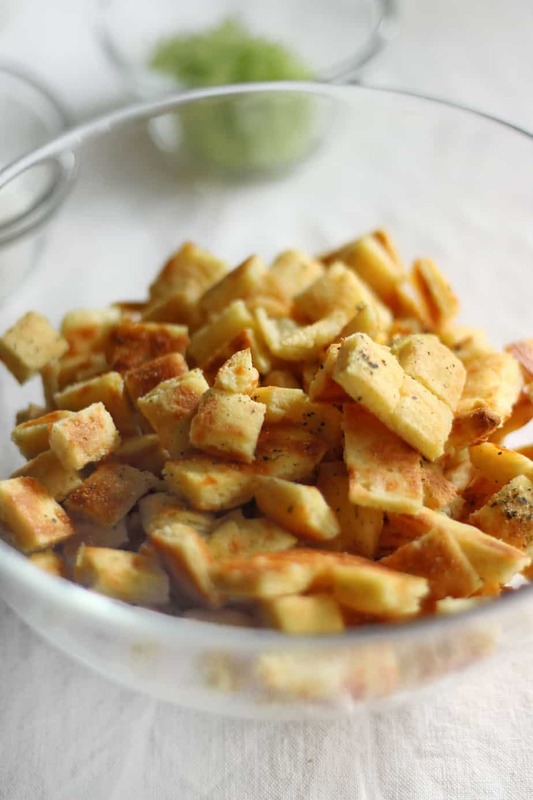 Place the the squares into a mixing bowl, then add the minced onion and celery. 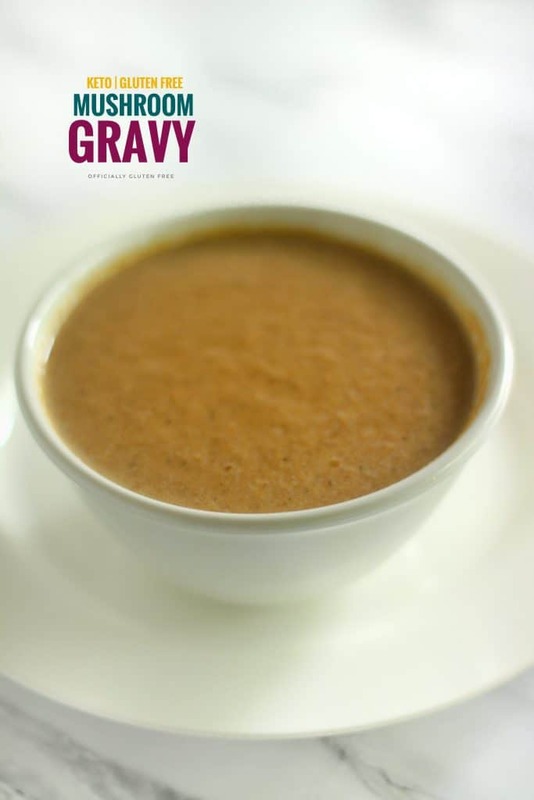 Add ½ a cup of the drippings or broth and mix until very well combined. Bake for 10 minutes, then stir and add the remaining drippings. Bake for another 10 - 15 minutes, stirring a few more times throughout. 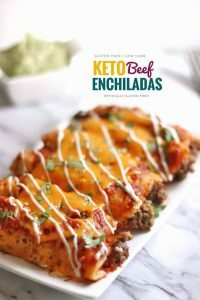 This Keto Fathead Stuffing Recipe Serves 4 people. 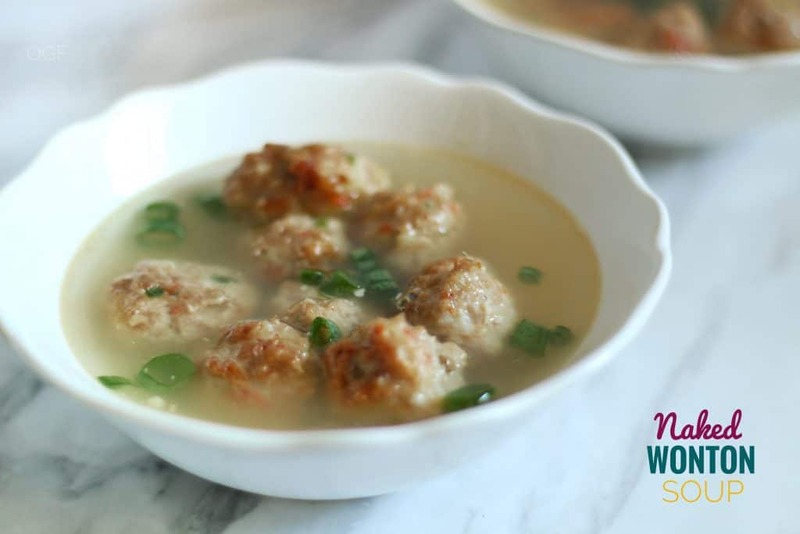 This Gluten Free & Keto Naked Wonton Soup is so Easy to Make and Tastes Just like Traditional Wonton Soup. 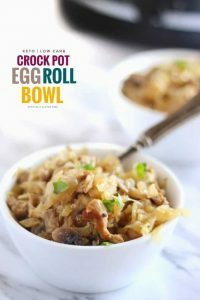 It’s a Great Low Carb Alternative that will satisfy Your Chinese Food Cravings. 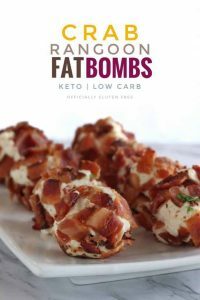 The juicy Pork and Prawn / Shrimp Wonton Meatballs are a Delightful Low Carb Twist on an Long Time Favourite. It’s so Flavourful and Delicious that you won’t even miss the wrapper. 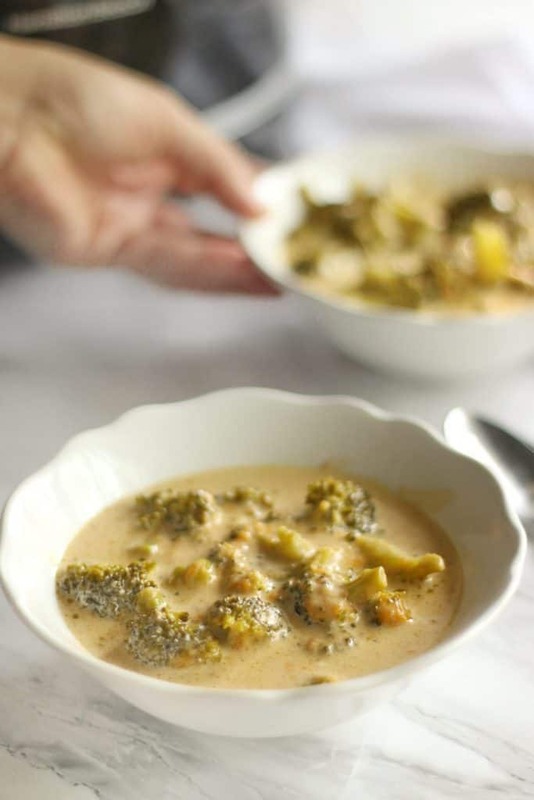 To make this Tasty Soup, you boil the chicken broth with the ginger and whole cloves of garlic. Let it simmer for 10 -15 minutes. 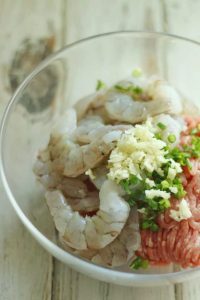 Then use a food processor to grind up the pealed shrimp and raw ground pork with the sesame oil, cloves of garlic and chopped green onion. 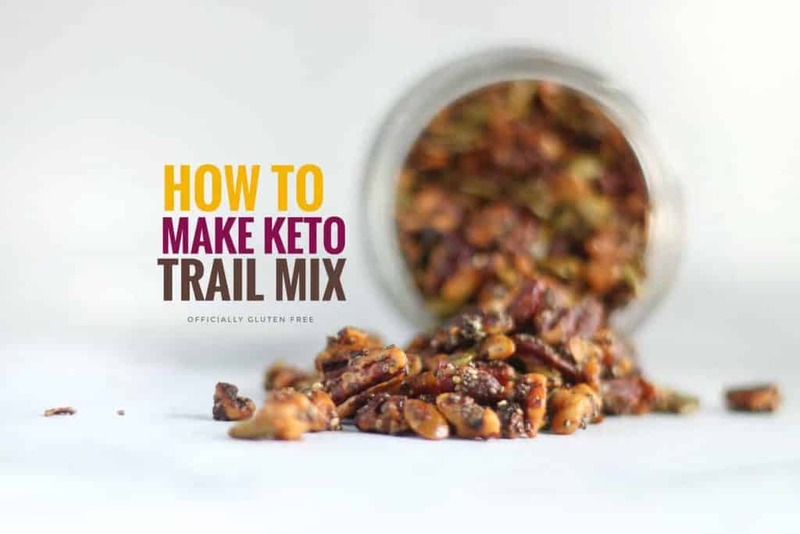 Mix it until it’s well combined. 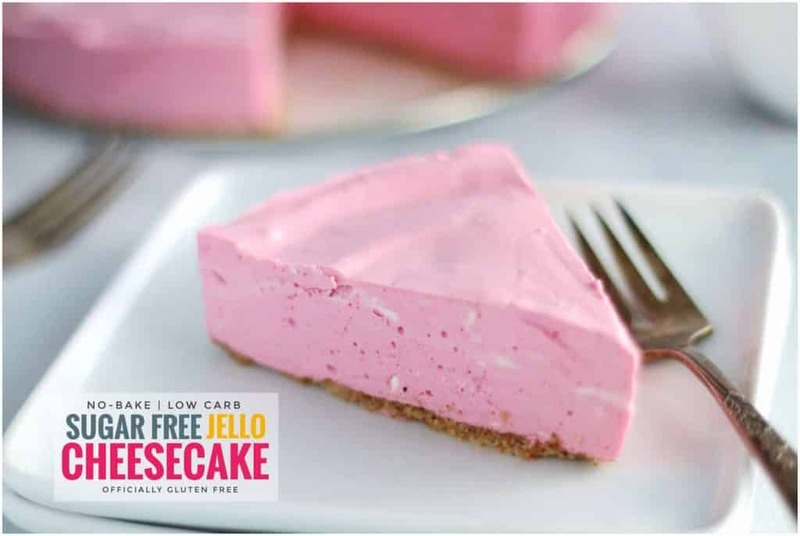 You can use a knife and cutting board for this step if you don’t have a food processor. 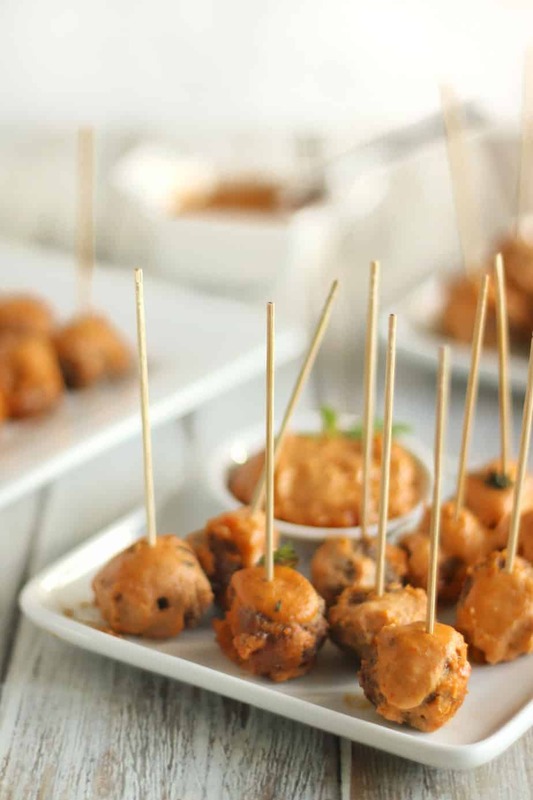 Preheat your oven, then shape the pork and shrimp mixture into small meatballs. 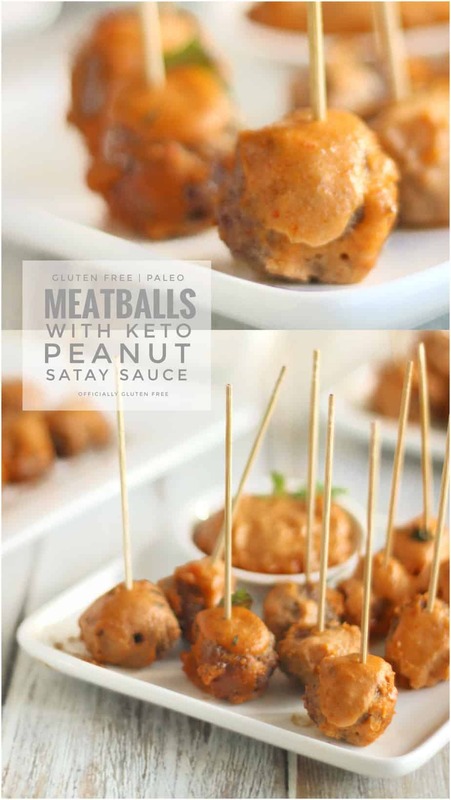 Place the meatballs into a baking dish, then bake for 20 – 25 minutes or until browned. Turn a few times throughout. 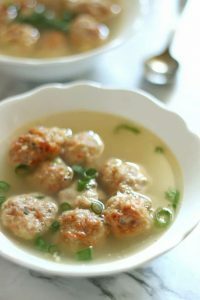 Remove the pieces of ginger and garlic from the broth, then add the cooked meatballs, the sesame oil and the chopped green onion to the pot. Let simmer for 5 – 10 minutes. My Family Loves this Naked Wonton Soup Recipe. When they ask if I could make it again, I’m happy to because it’s so much easier than having to wrap the wontons in a wrapper and I think they taste just as good. 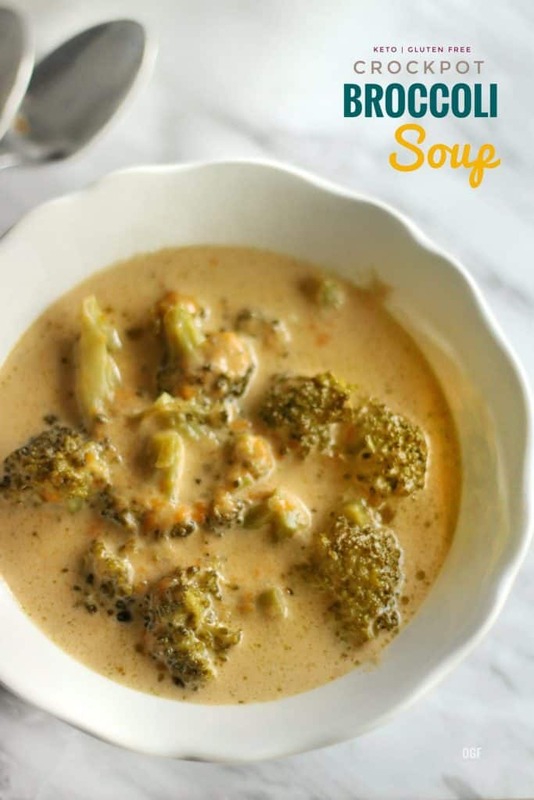 I also love how healthy this soup is. Bone broth is so good for you and is a great way to make your meals go a bit farther. Whenever we get a roasted chicken, (which is usually once a week) I boil down the bones in a large pot over medium heat for a few hours. Then I use a strainer and bowl to Separate the liquid from the bones. 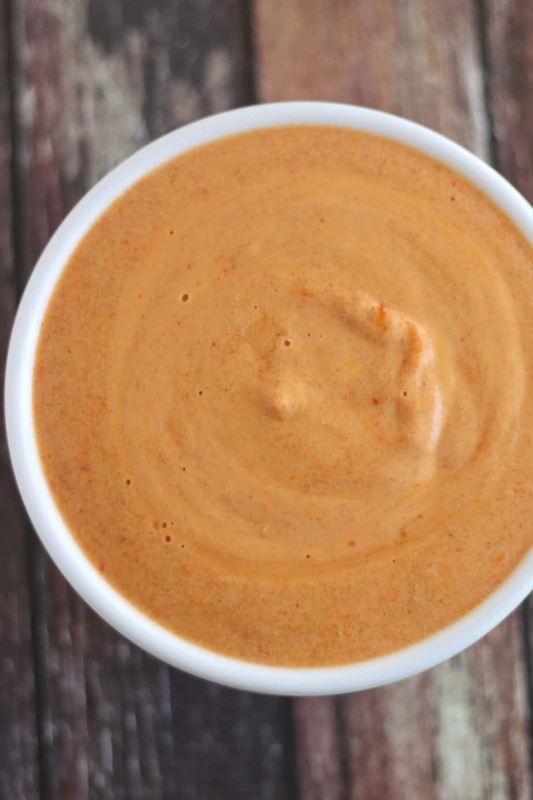 I save it in the freezer to make soup or sauces with throughout the week. 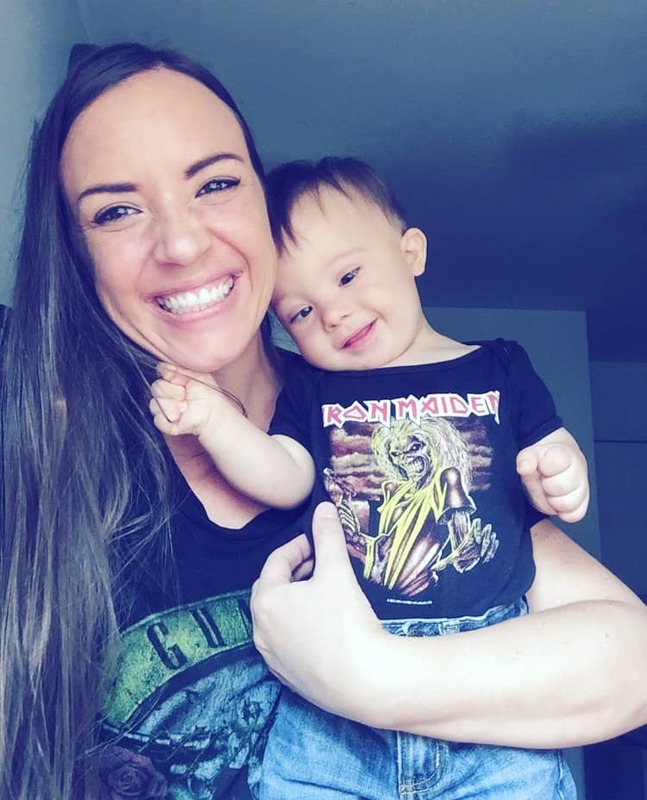 A lot of people are having huge success with this diet. They’re loosing weight extremely fast and finding it really easy to stick to. 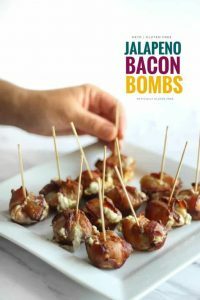 There are just so many delicious things you can eat and most say they never really feel hungry. Unlike other diets where you always feel like you’re starving to death. 1. In a large pot boil the chicken broth with the piece of ginger and 2 whole cloves of garlic. Let simmer for 10 -15 minutes. 3. 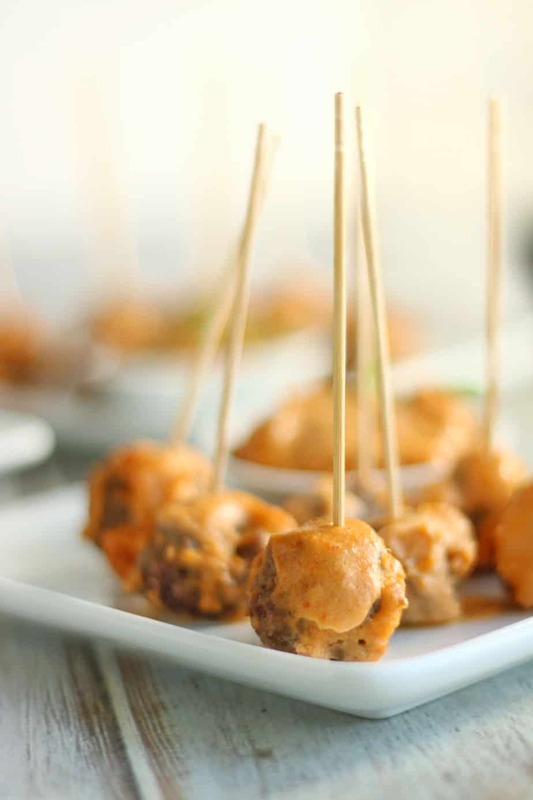 Preheat oven to 400 F. Shape the pork and shrimp mixture into small meatballs. 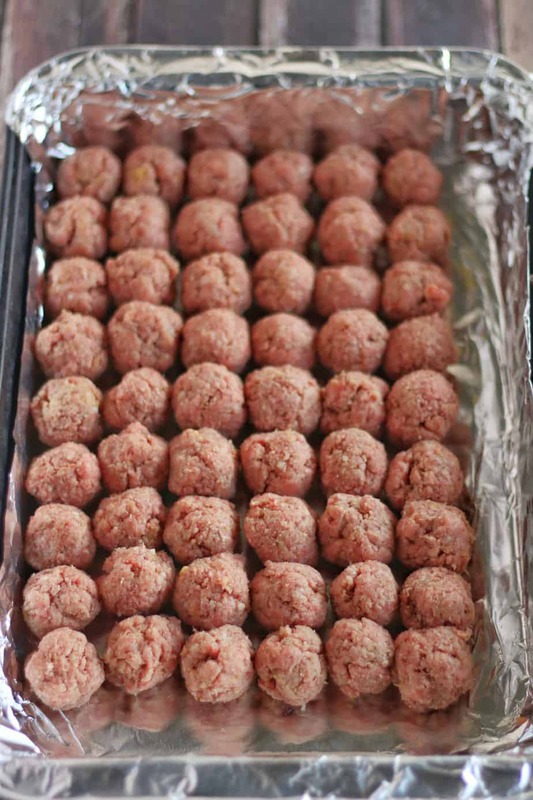 Place the meatballs into a baking dish, then bake for 20 – 25 minutes or until browned. Turn a few times throughout. 4. Remove the pieces of ginger and garlic from the broth. Add the cooked meatballs, 1/2 tsp sesame oil and the last chopped green onion to the pot. 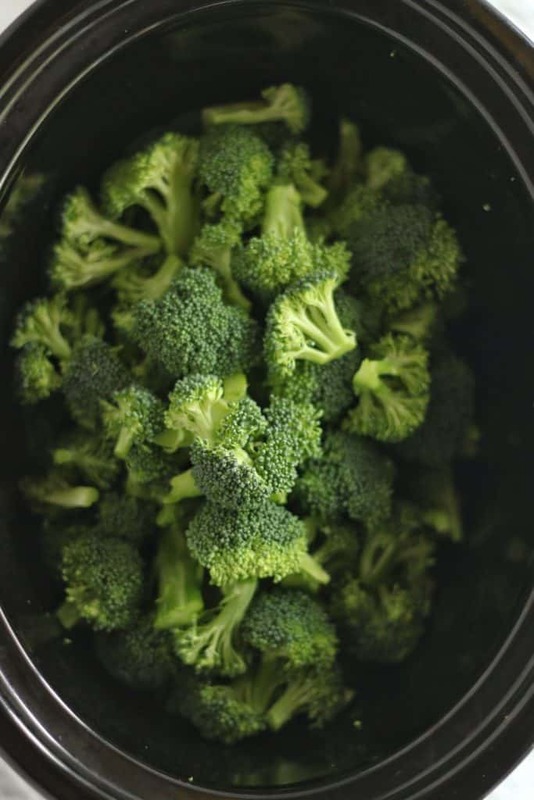 Let simmer for 5 – 10 minutes. This recipe for Naked Wonton Soup serves 4 People. 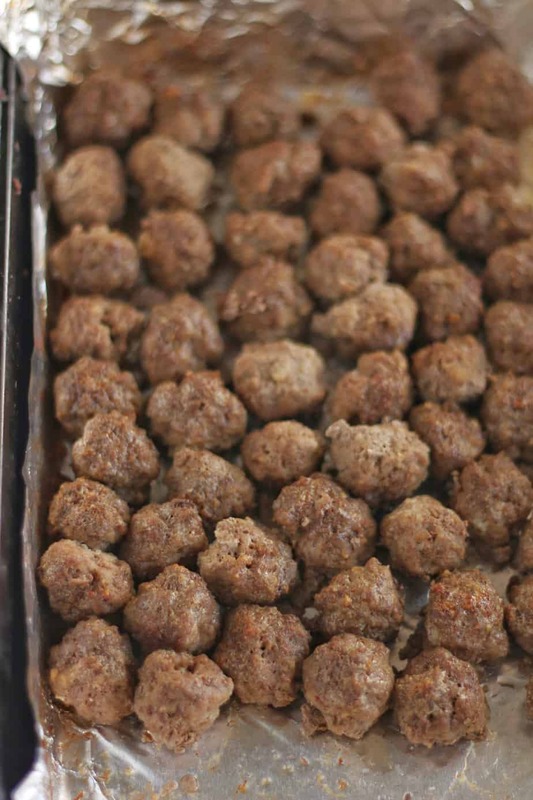 Note: To Freeze this soup: Freeze the cooked meatballs separate from the broth. 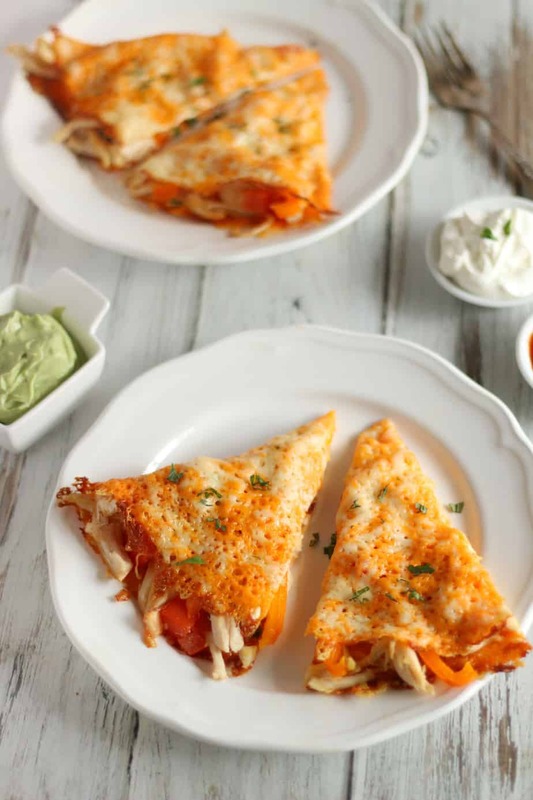 Let thaw before reheating. In a large pot boil the chicken broth with the piece of ginger and 2 whole cloves of garlic. Let simmer for 10 -15 minutes. 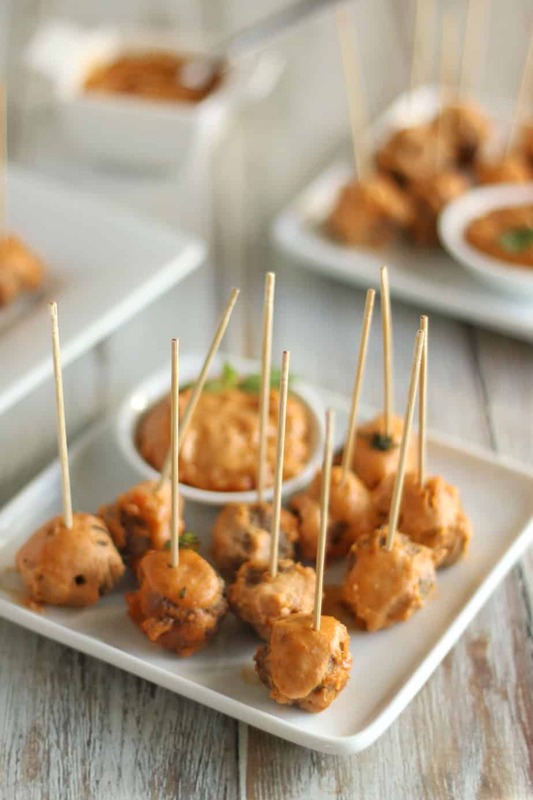 Preheat oven to 400 F. Shape the pork and shrimp mixture into small meatballs. 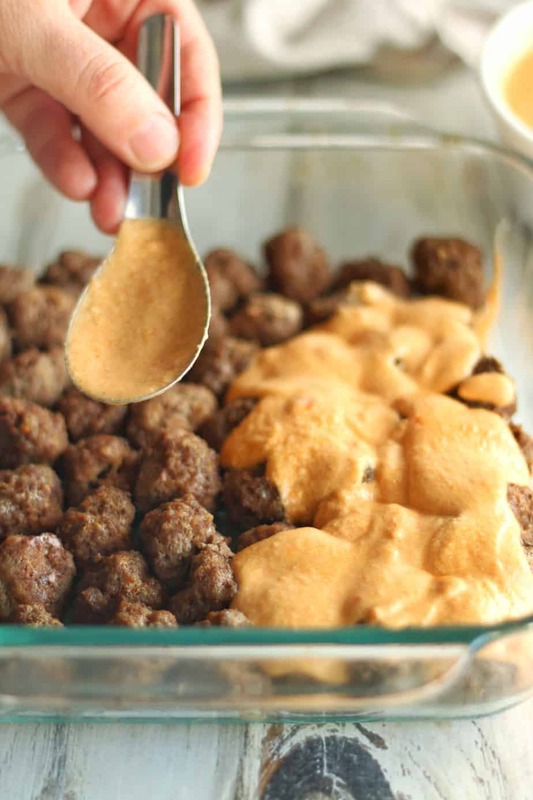 Place the meatballs into a baking dish, then bake for 20 - 25 minutes or until browned. Turn a few times throughout. Remove the pieces of ginger and garlic from the broth. 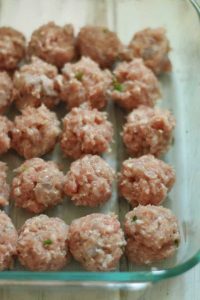 Add the cooked meatballs, ½ tsp sesame oil and the last chopped green onion to the pot. Let simmer for 5 - 10 minutes. 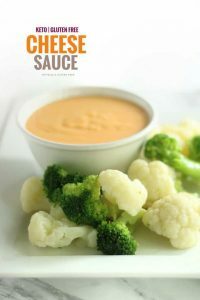 This 4 Ingredient Easy Keto Cheese Sauce is so Cheesy! 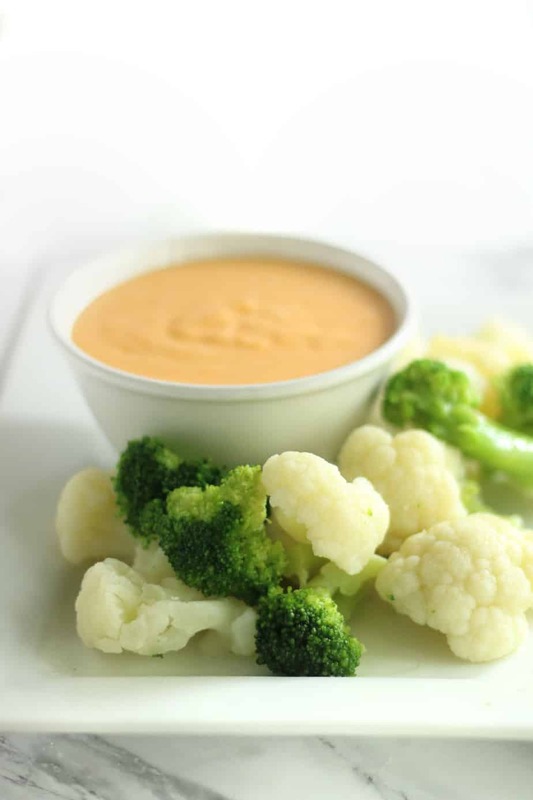 It’s a really Easy Low Carb Cheese Sauce that’s Perfect with Steamed Vegetables, Keto Nachos or a Delicious Keto Cauliflower “Mac” and Cheese. 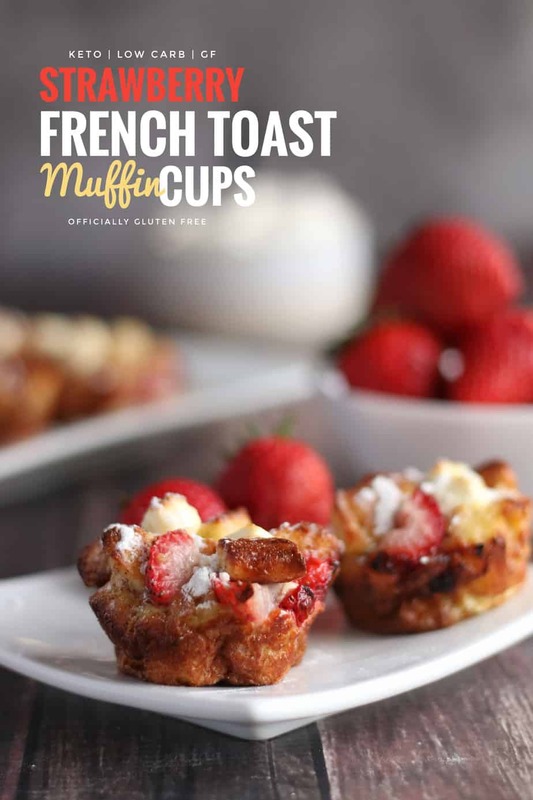 It’s naturally Gluten Free and is Loaded with Flavour and Provides a Nutritious Hit of Healthy Fats. 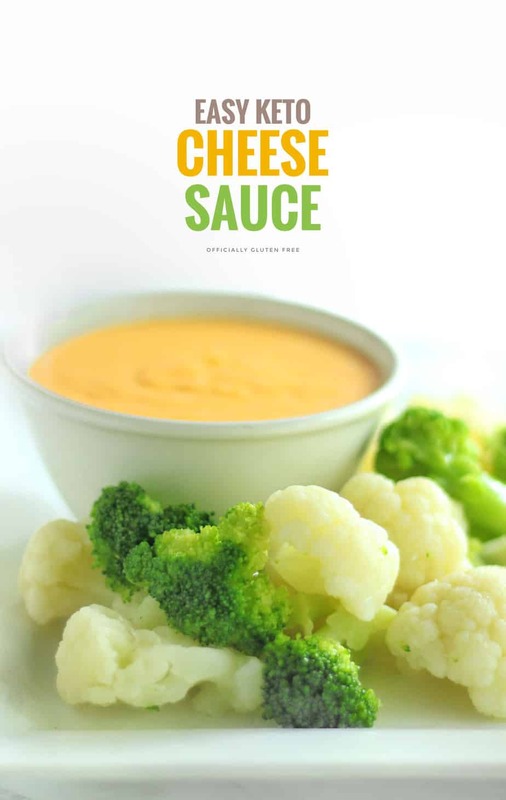 To make this Easy Keto Cheese Sauce, you melt the butter. Then add the cream cheese. 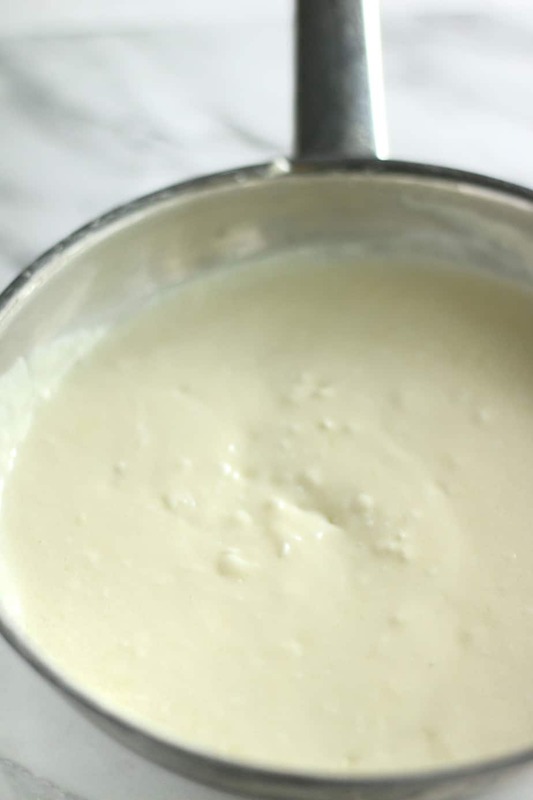 Stir continuously until the cream cheese is melted. Then slowly stir in the heavy cream continuing to stir continuously until the mixture comes to a boil. 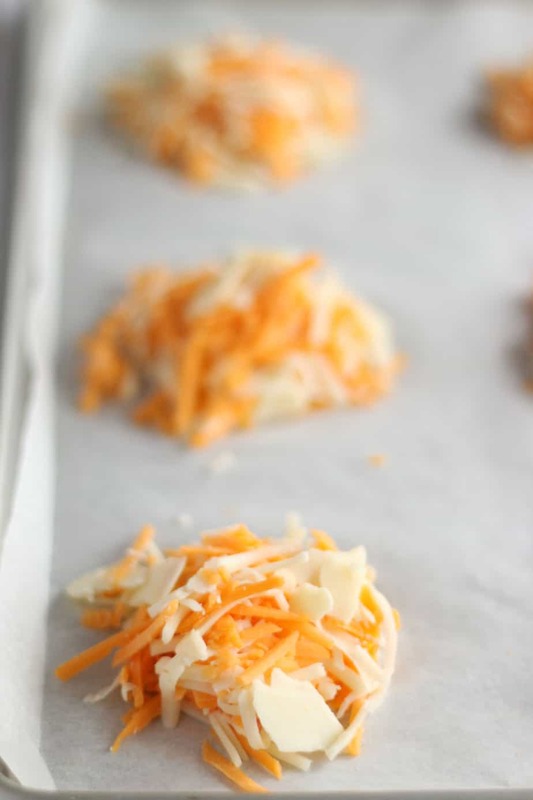 Add the cheddar cheese, then stir until the cheese is fully incorporated. 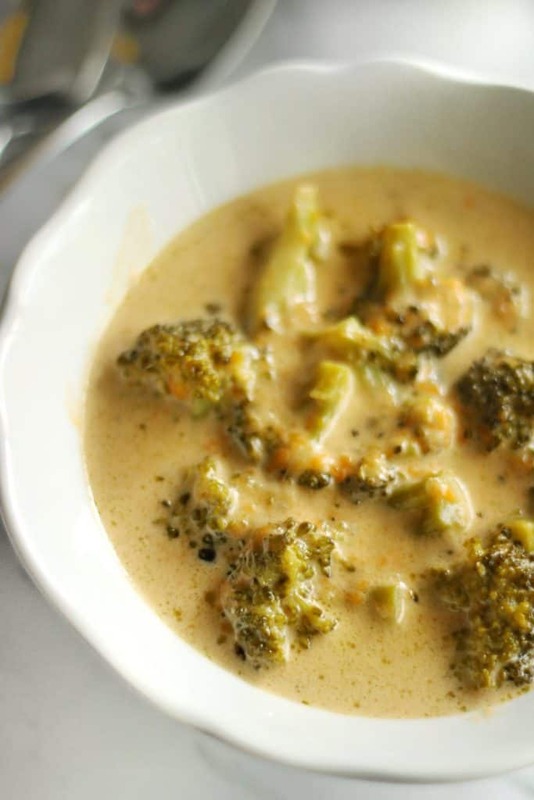 Let simmer over low heat for 5- 10 minutes or until it’s reached your desired thickness. 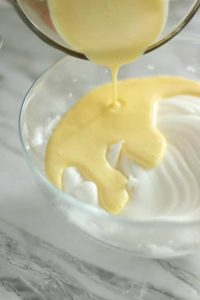 This Rich and Creamy Easy Keto Cheese Sauce is so Simple and Satisfying. 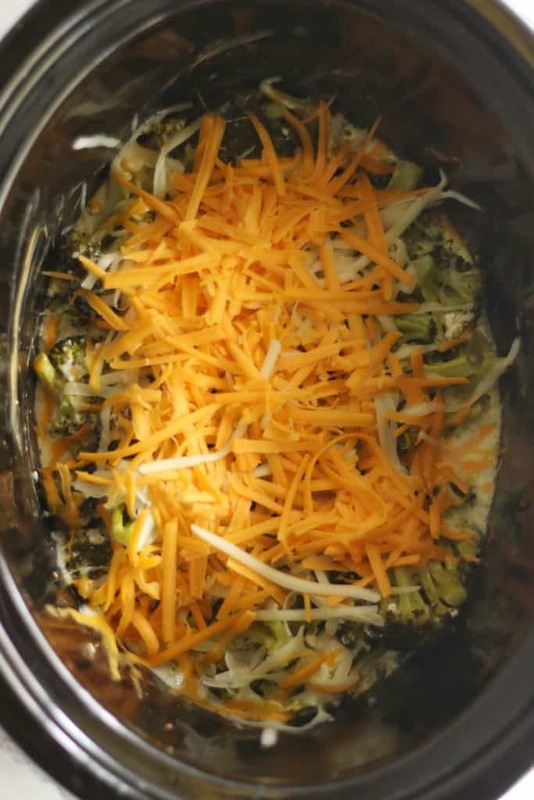 I like to Serve it over Steamed Vegetables or use it to make a Deliciously Cheesy Vegetable Casserole. When I make the Veggie Casserole I like to cover it with Cheese and Pork Rind Crumbs. Then I Bake it until the Top is Golden Brown. 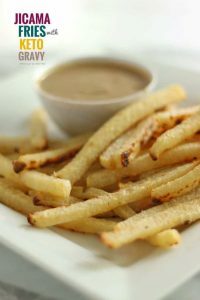 It’s Definitely one of my Families Favourite Side Dishes and I Love how Quick and Easy it is to Make. 1. Over med heat, melt the butter. Then add the cream cheese. Stir continuously until the cream cheese is melted. Slowly stir in the heavy cream continuing to stir continuously until the mixture comes to a boil. 2. Add the cheddar cheese, then stir until the cheese is fully incorporated. 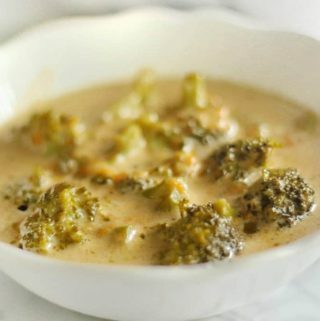 Let simmer over low heat for 5- 10 minutes or until it’s reached your desired thickness. Note: Let simmer longer For a Thicker Sauce. The Sauce will thicken slightly as it cools. To thin the sauce stir in a little water. 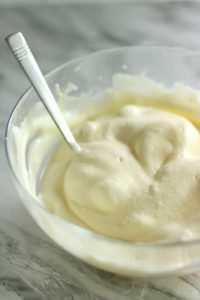 This 4 Ingredient Easy Keto Cheese Sauce is so Cheesy! 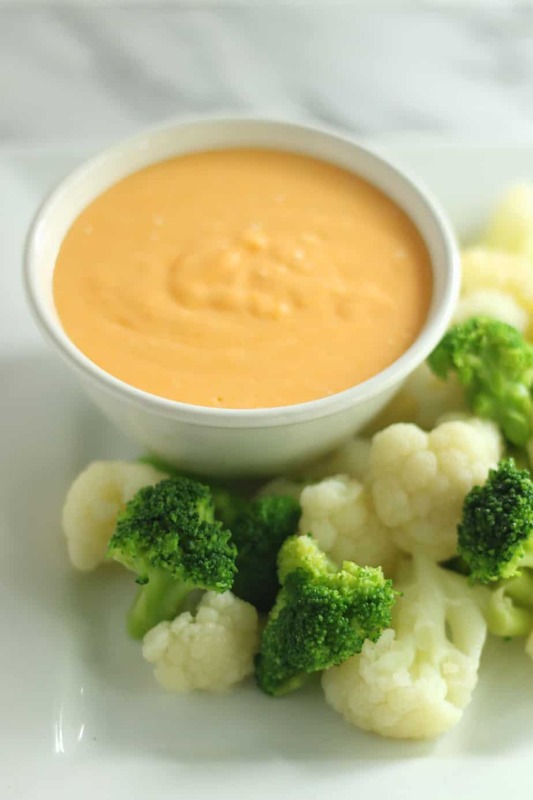 It's a really Easy Low Carb Cheese Sauce that's Perfect with Steamed Vegetables, Keto Nachos or a Delicious Keto Cauliflower "Mac" and Cheese. Over med heat, melt the butter. 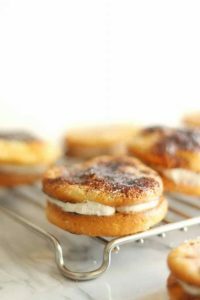 Then add the cream cheese. Stir continuously until the cream cheese is melted. Slowly stir in the heavy cream continuing to stir continuously until the mixture comes to a boil. 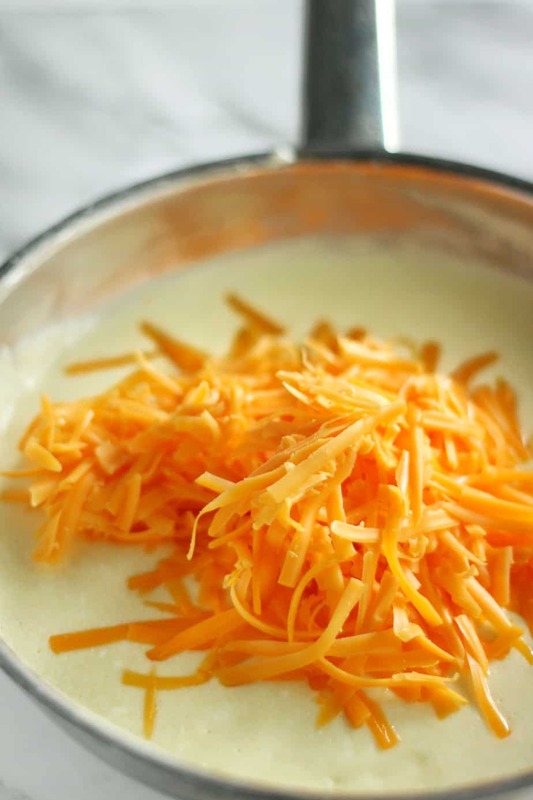 Add the cheddar cheese, then stir until the cheese is fully incorporated. 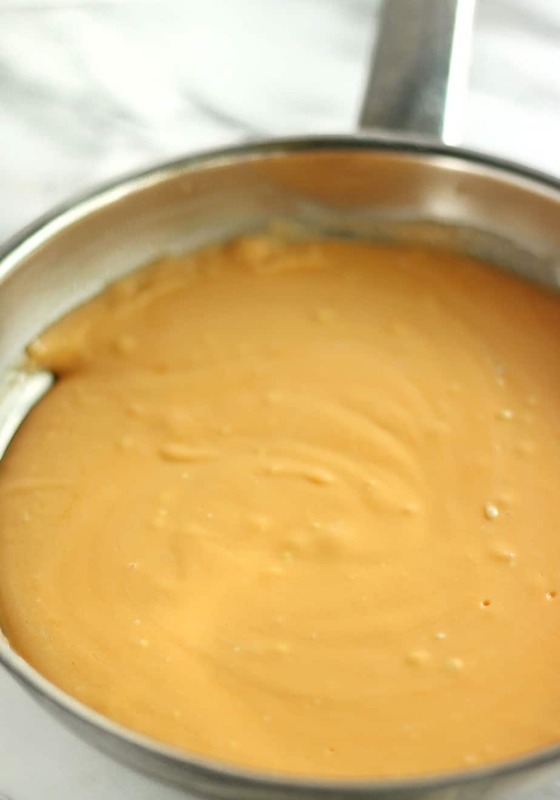 Let simmer over low heat for 5- 10 minutes or until it's reached your desired thickness. 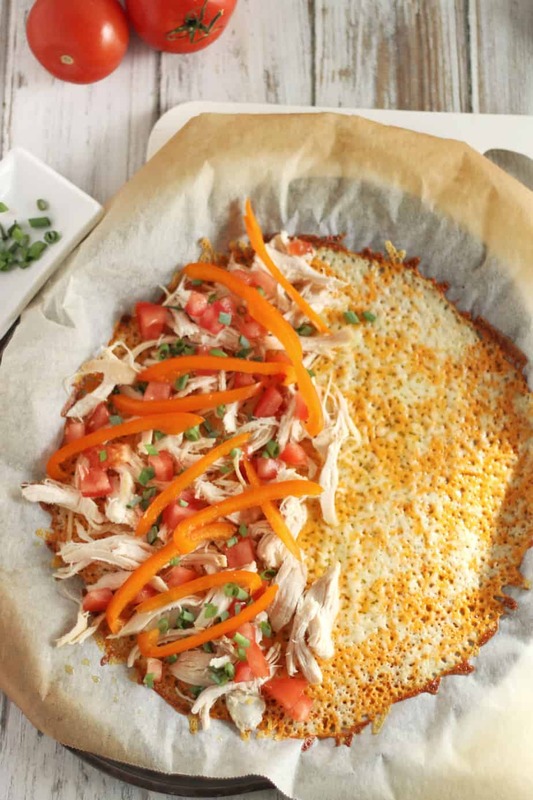 This is my version of Fathead Keto Pizza Crust. 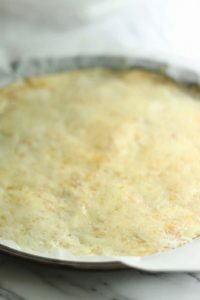 It’s a Low Carb and Nut, Gluten Free Pizza Crust that’s made with Mozzarella Cheese, Cream Cheese, Egg, Crushed Pork Rinds and and a little bit of Coconut Flour. 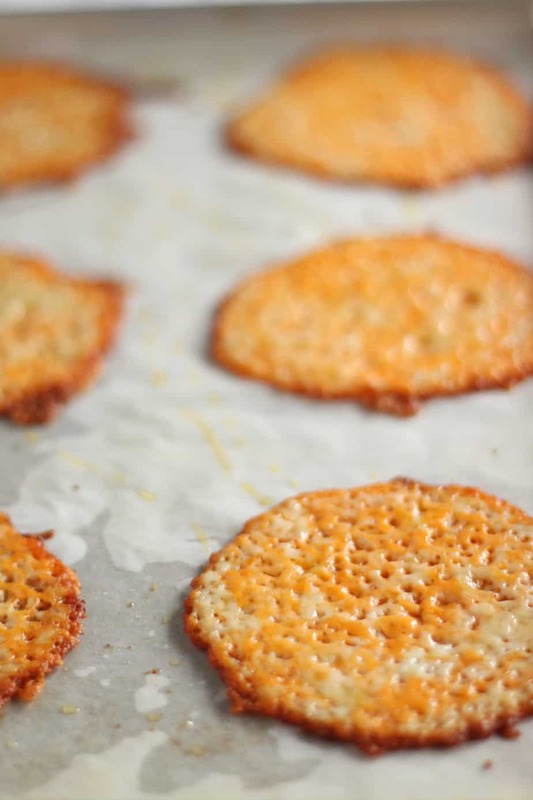 I like to use crushed pork rinds instead of almond flour because it has less calories and is a lot cheaper. I also really like the way it tastes. 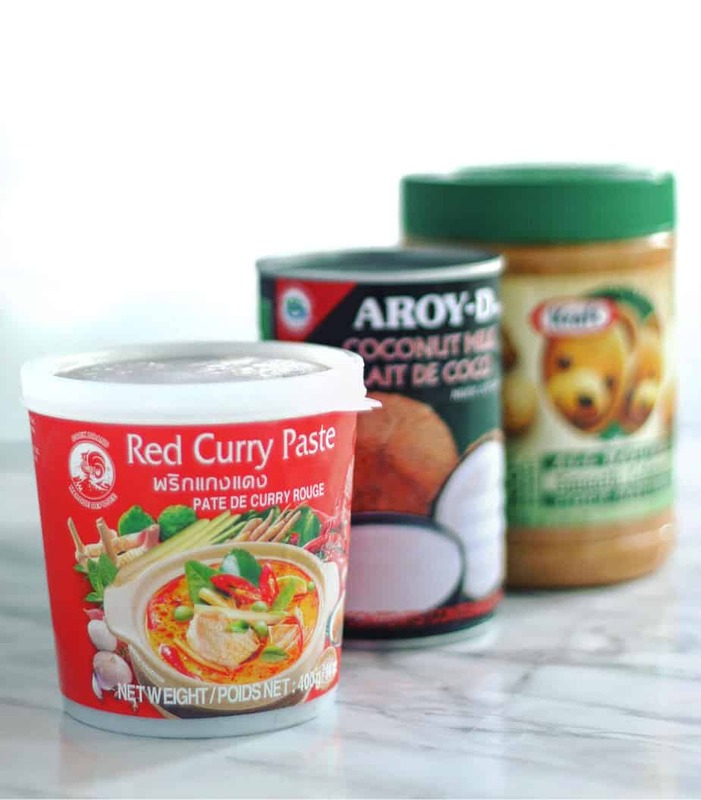 If you don’t eat pork or just don’t like pork rinds, you can easily substitute it for almond or coconut flour. 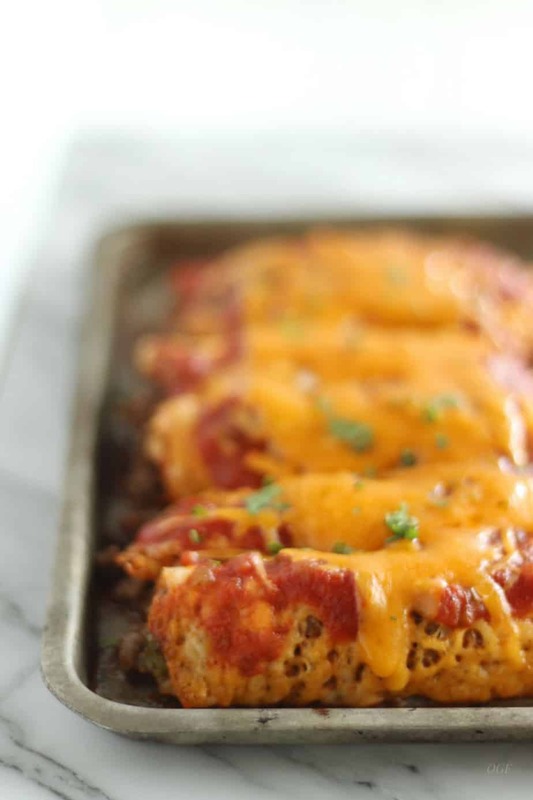 You’re going to love how easy this recipe is. 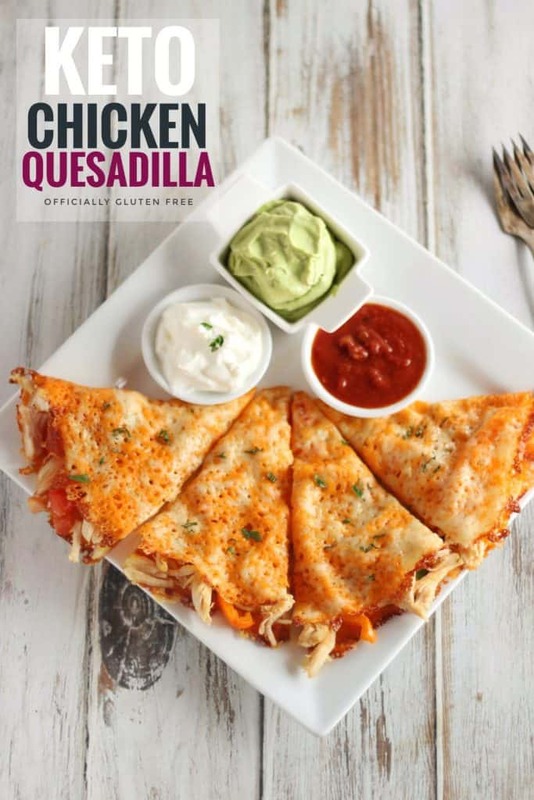 All you have to do is melt the shredded mozzarella and the cream cheese in a small frying pan over medium heat. Then, remove from the heat and stir the cheeses until well combined. 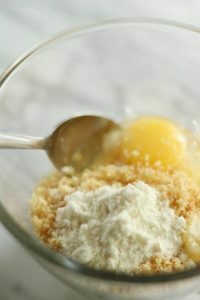 In a mixing bowl, add the crushed pork rinds, coconut flour and egg to the cheese mixture, then mix until well combined. Next, line a pizza pan with parchment paper. 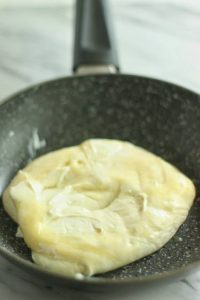 Place the ball of dough in the centre of the pan, then cover the ball with another piece of parchment paper. Press the dough out until it’s even on all sides. 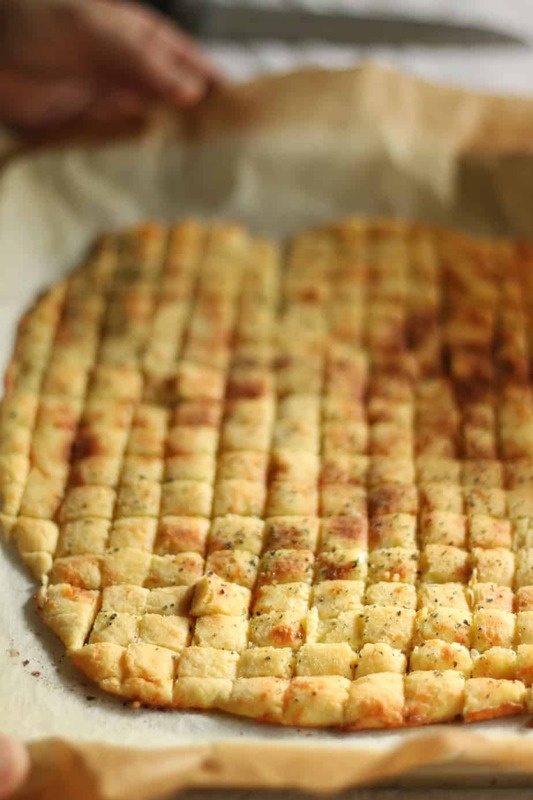 Remove the top piece of parchment paper then poke the crust with a fork all over. 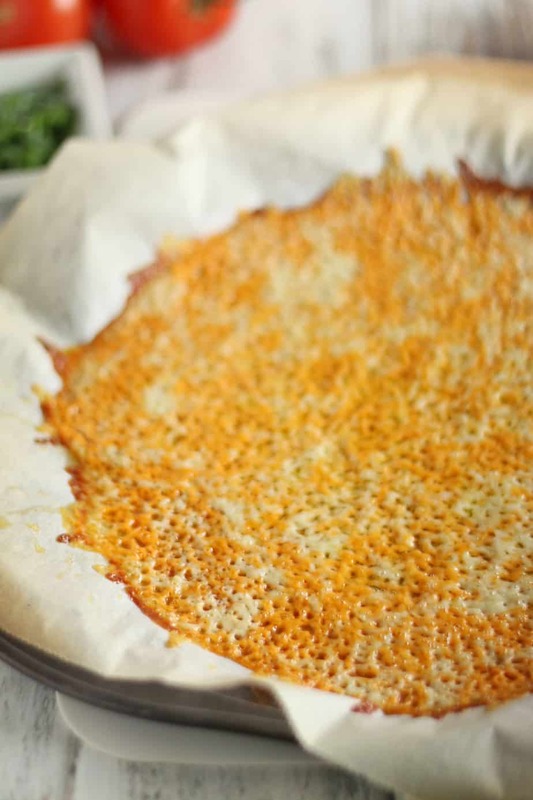 Bake the crust for 7-10 minutes or until the edges are slightly brown. 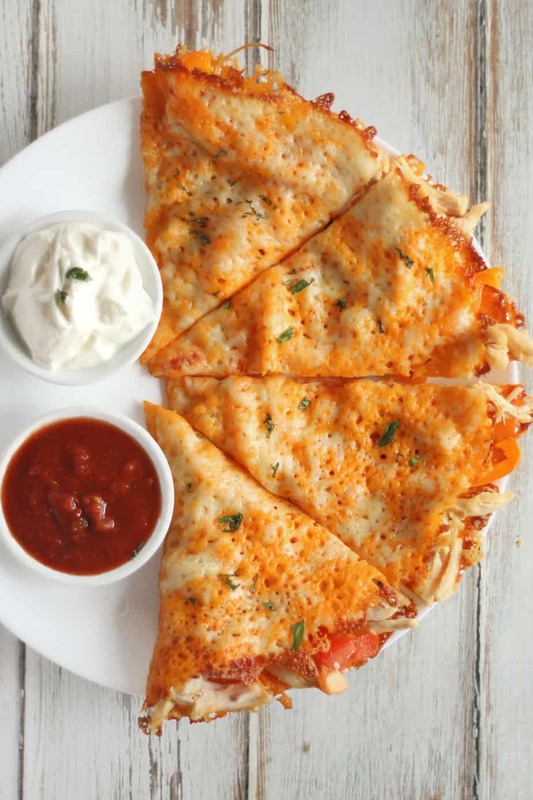 Remove Crust from the oven, then cover with pizza sauce, cheese and toppings of your choice. 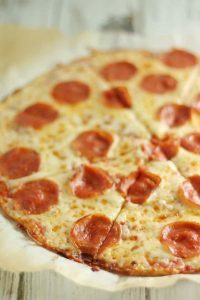 Turn your oven to broil, then bake the pizza for another 5-10 minutes or until the top is browned. 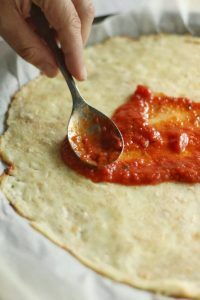 This Gluten Free & Keto Pizza Crust is a Delicious Thin Crust Pizza that’s so Good you’d Never even Know it’s Low Carb. It’s my 10 year olds Absolute Favourite kind of Crust which is Perfect because I’ve been making it at least once a week. 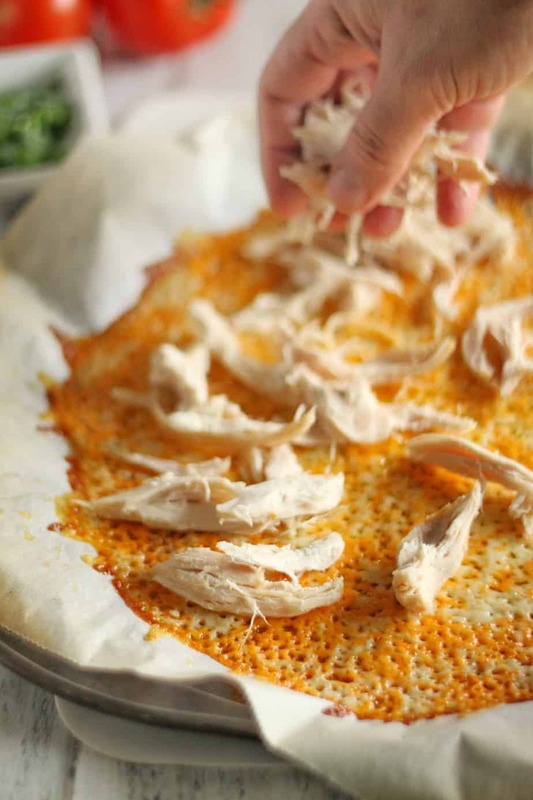 I love that it’s so much easier than my Rice Flour Pizza Crust. 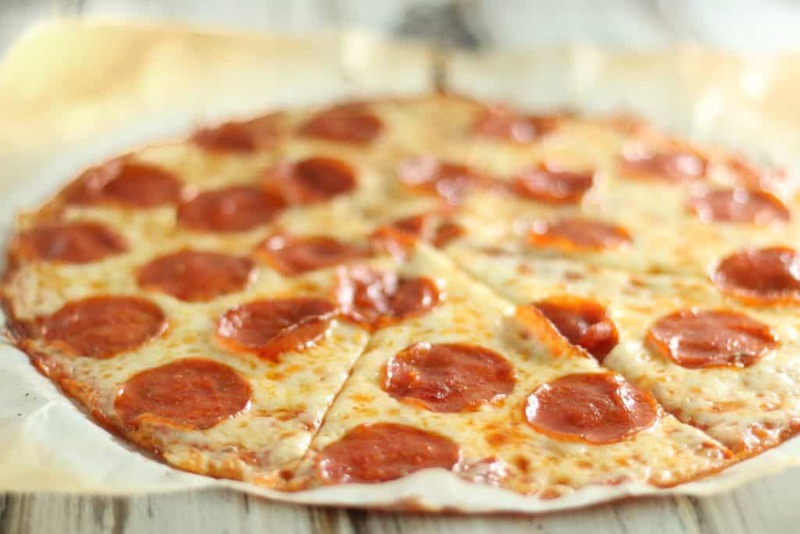 You can whip up a pizza in minutes without having to wait for anything to rise. 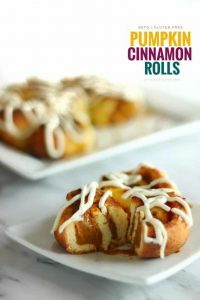 The dough is so versatile and easy to make it has me wondering what else I could make with it. 1. 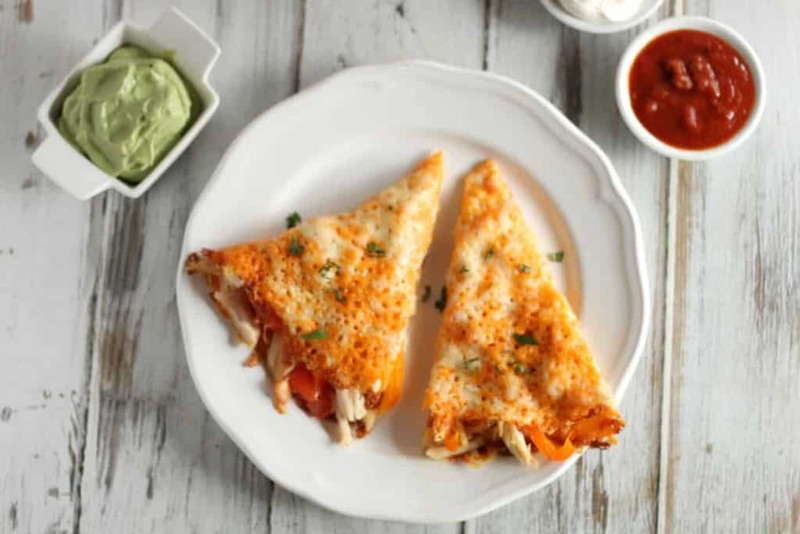 Preheat oven to 400 F. Melt the shredded mozzarella and the cream cheese in a small frying pan over medium heat. 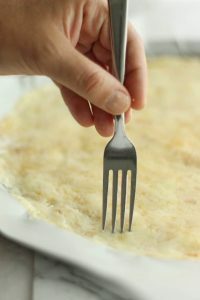 (This step can also be done in a microwave) Remove from the heat, then stir the melted cheeses until they’re well combined. 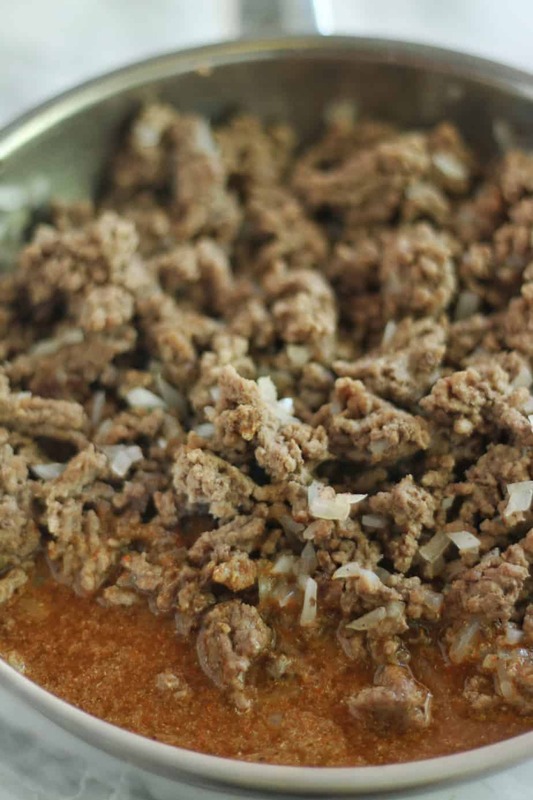 Then using a mixing bowl, add the crushed pork rinds, coconut flour and egg to the cheese mixture. Mix until well combined. 2. 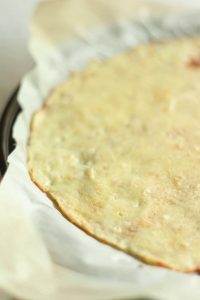 Line a pizza pan with parchment paper. Place the ball of dough in the centre of the pan, then cover the ball with another piece of parchment paper. Press the dough out until it’s even on all sides. Remove the top piece of parchment paper then poke the crust with a fork all over. Bake the crust for 7-10 minutes or until the edges are slightly brown. 3. 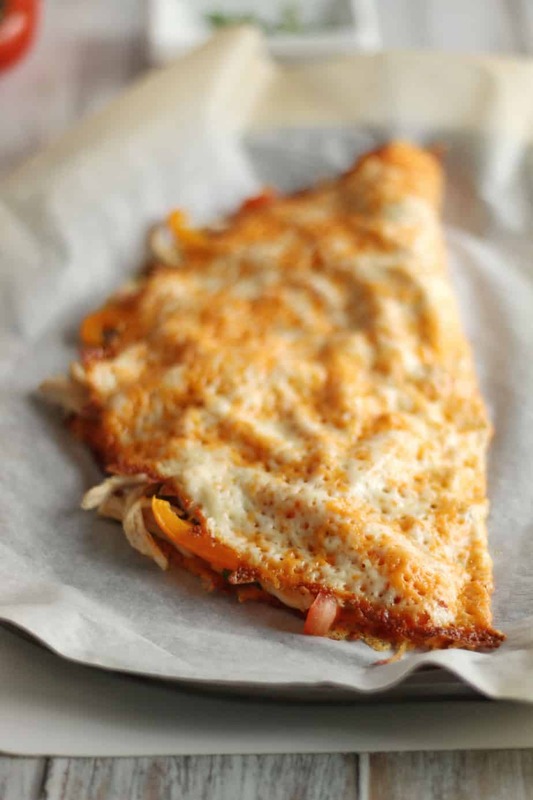 Remove Crust from the oven, then cover with sauce, cheese and toppings of your choice. 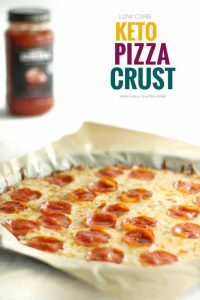 Turn your oven to broil, then bake the pizza for another 5-10 minutes or until the top is browned. 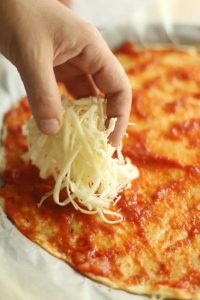 This recipe makes 1 Keto Pizza Crust. 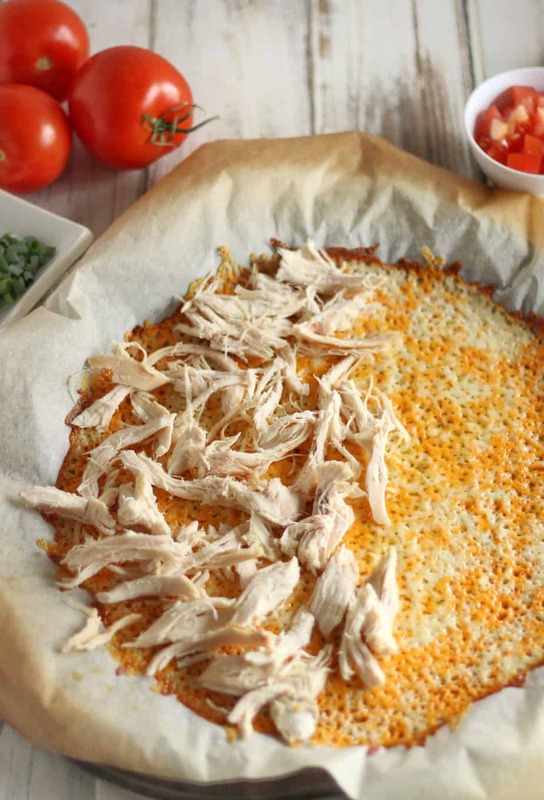 Nutritional Info – 1 Keto Pizza Crust = 3 Servings | Each Serving (For Crust Only) = 374 Cal, 28.3 g of Fat, 5.1 g of Carbs, 1.7 g of Fibre and 1.5 g of Sugar. 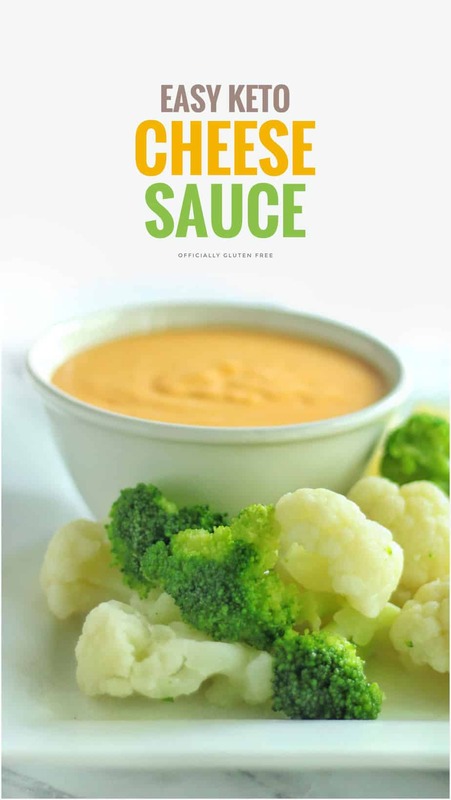 Below is the sauce that I use. 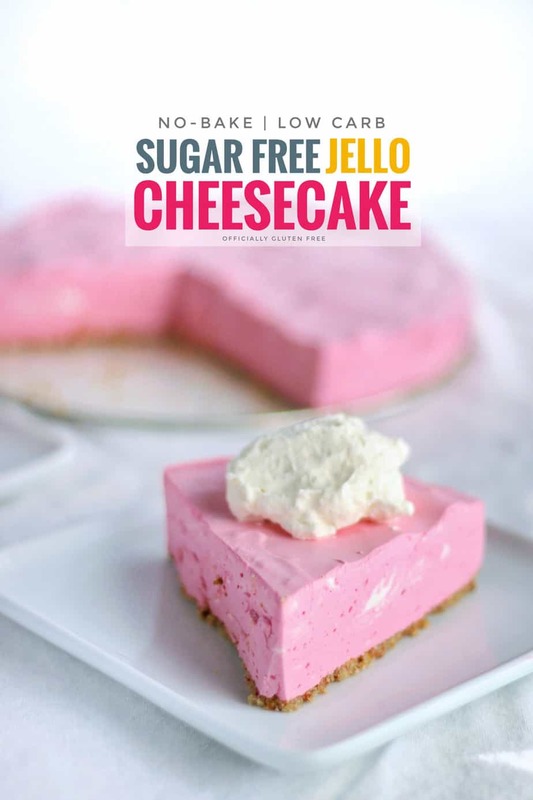 It has 5 g of Sugar and 2 g of Fibre in a 1/2 Cup Serving. I found a half cup was enough for the whole pizza, which we split into 3. It’s more expensive but goes a long way. 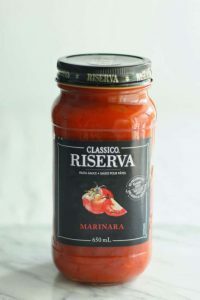 This sauce had the least amount of sugar of all the sauces in my supermarket. 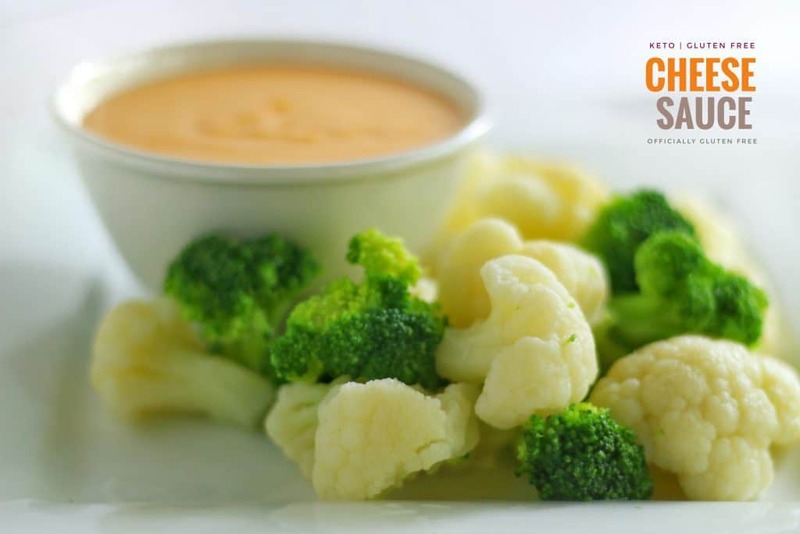 If it’s still to much sugar for you, than you could try using an Alfredo Sauce or Garlic Butter as a Base instead. 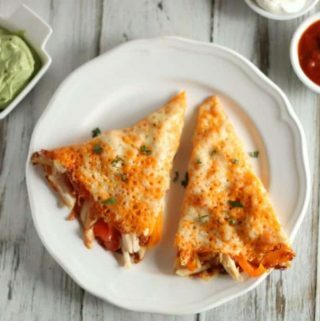 Preheat oven to 400 F. Melt the shredded mozzarella and the cream cheese in a small frying pan over medium heat. 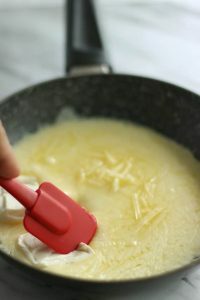 Remove from the heat, then stir the melted cheeses until well combined. 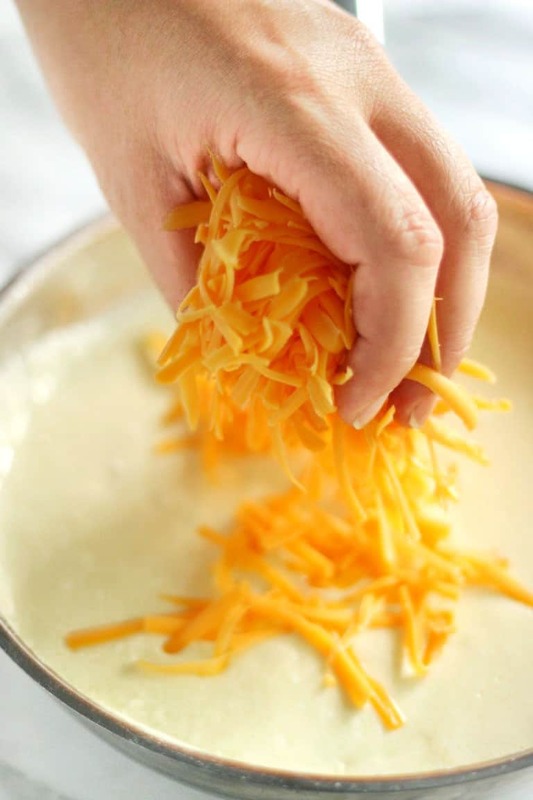 In a mixing bowl, add the crushed pork rinds, coconut flour and egg to the cheese mixture. Mix until well combined. 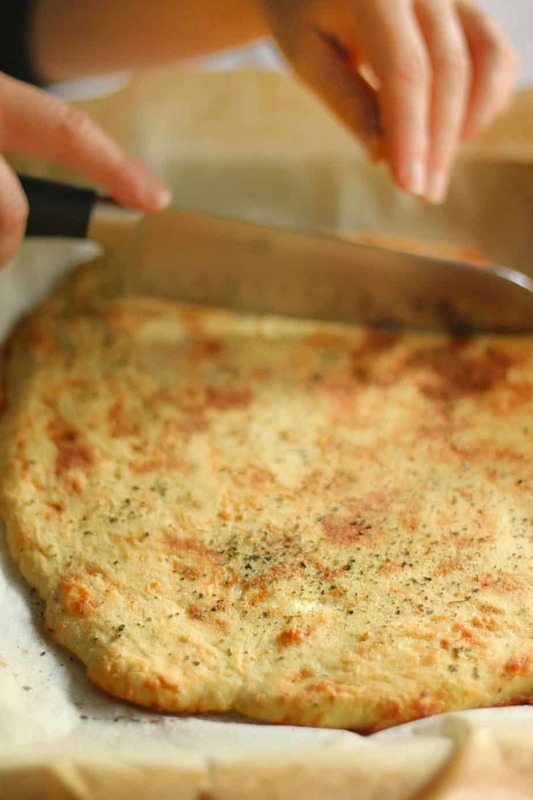 Line a pizza pan with parchment paper. Place the ball of dough in the centre of the pan, then cover the ball with another piece of parchment paper. Press the dough out until it's even on all sides. Remove the top piece of parchment paper then poke the crust with a fork all over. 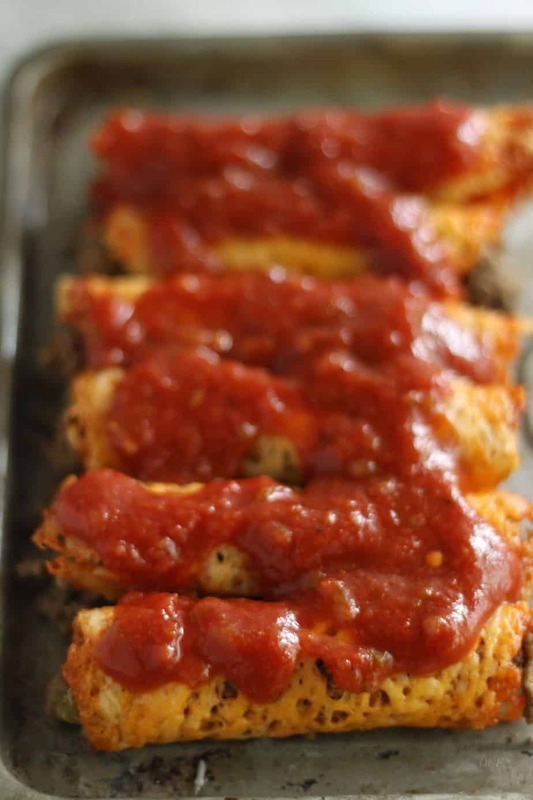 Bake the crust for 7-10 minutes or until the edges are slightly brown. 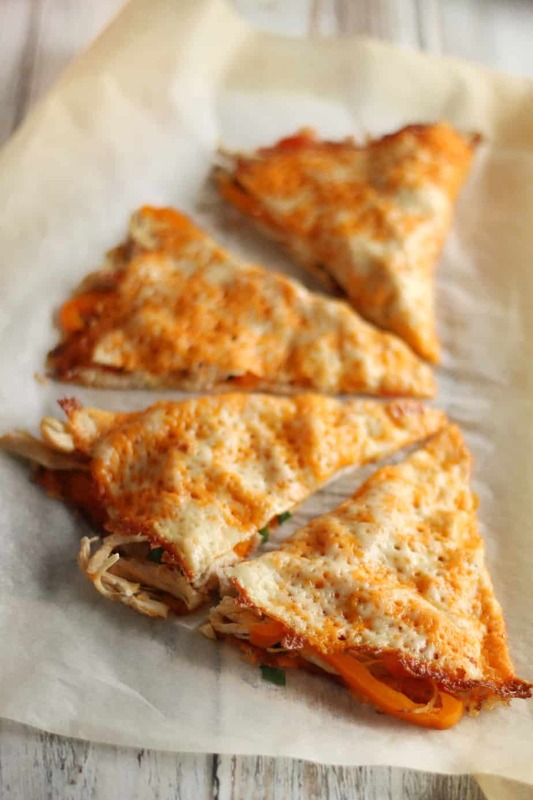 Remove Crust from the oven, then cover with sauce, cheese and topping of your choice. 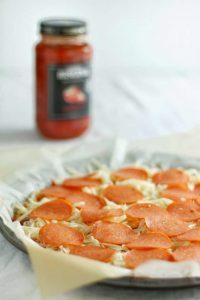 Turn your oven to broil, then bake the pizza for another 5-10 minutes or until the top is browned. 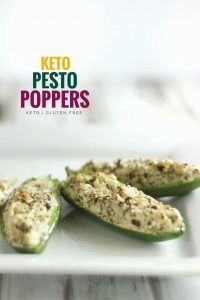 These 4 Ingredient Gluten Free and Keto Pesto Poppers make a great Low Carb Appetizer, Side Dish or Snack. 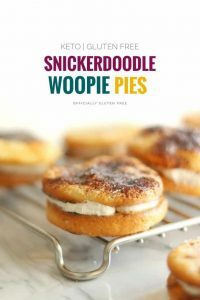 They can be whipped up in a couple of minutes with minimal effort and are loaded with Flavour and heathy Fats. 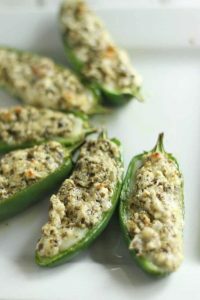 The Creamy Cream Cheese and Pesto goes Perfectly with the Heat from the Jalapeños. 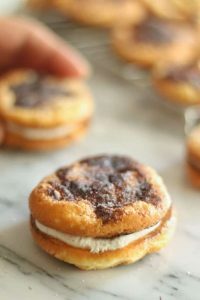 They’re so Simple and Easy to Make and they Taste Amazing. 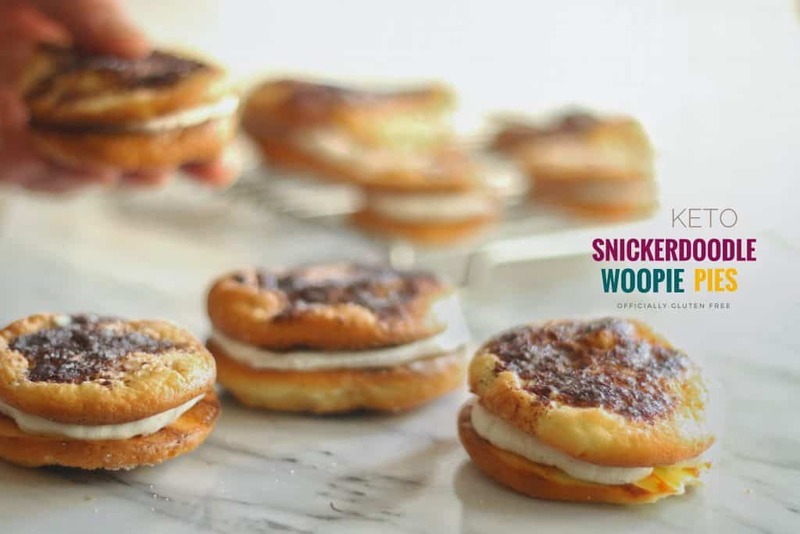 They’re incredibly easy to make. 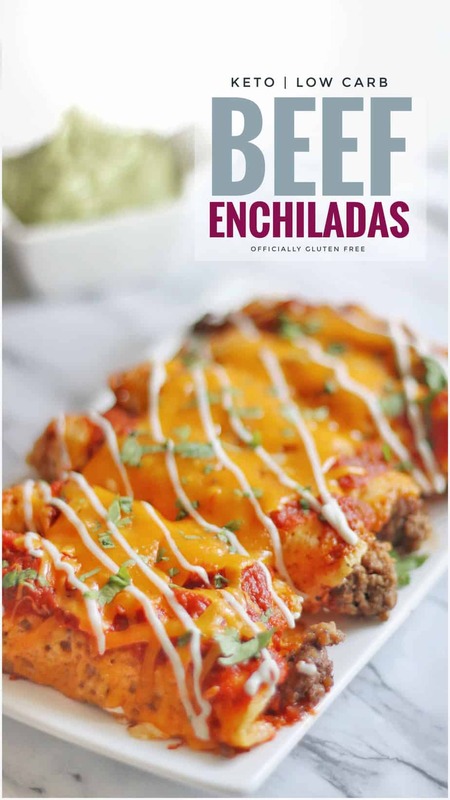 Start by slicing the jalapeños in half. Then remove the seeds. 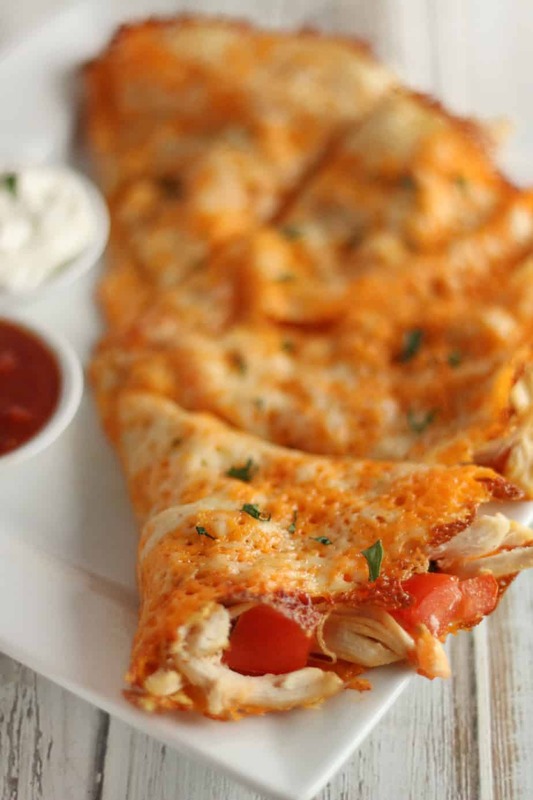 Place onto a baking sheet, then cut the mozzarella cheese into 6 slices. 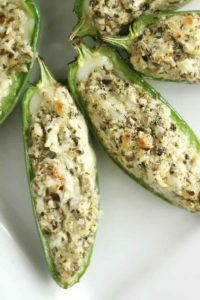 Place onto each of the jalapeños. 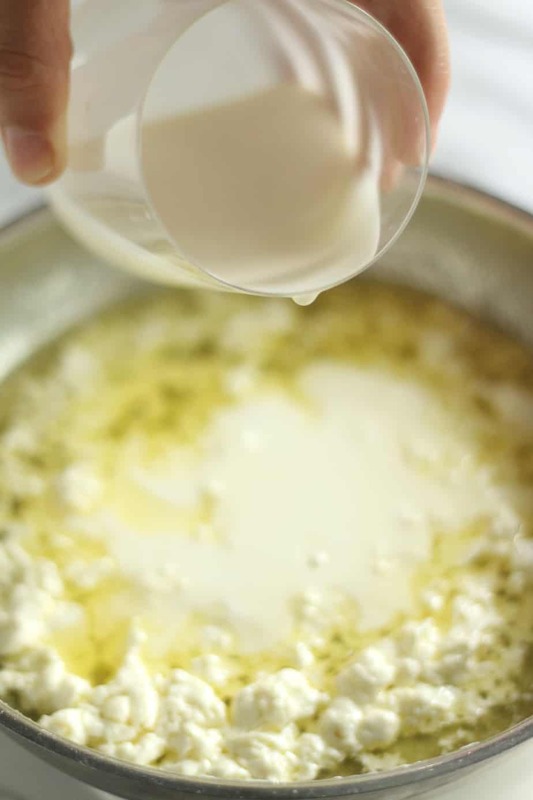 Then in a mixing bowl, mix the cream cheese and the rest of the mozzarella. Add the pesto and mix until well combined. Divide the pesto cheese into 6 then place onto each of the jalapeños. 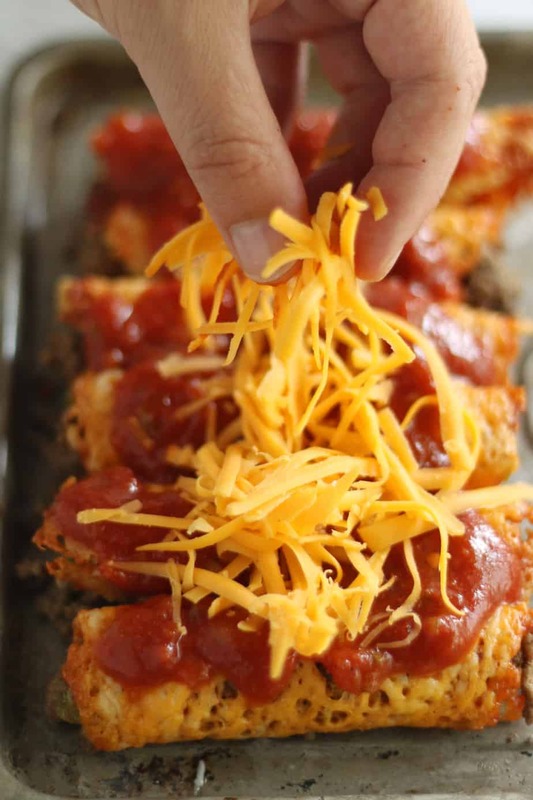 Bake for 12 – 15 minutes. 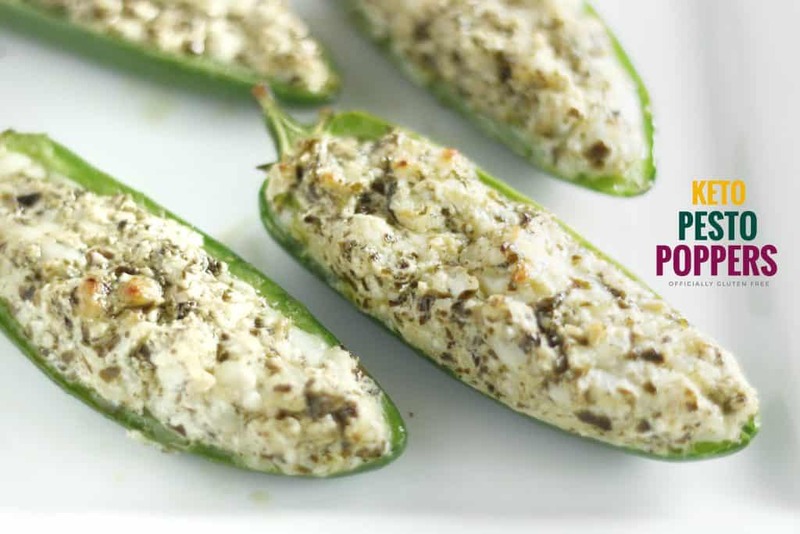 These Keto Pesto Poppers are packing the perfect amount of Heat and Flavour. 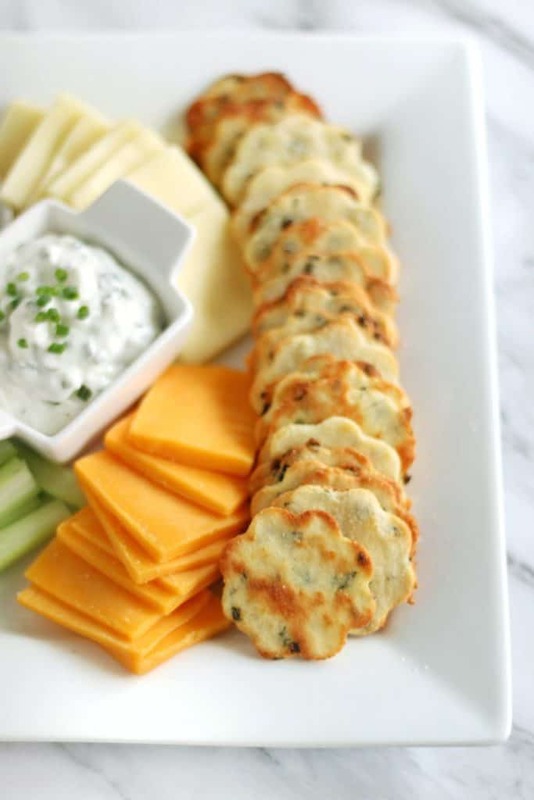 They make a fantastic make ahead appetizer that can be reheated in a few minutes. 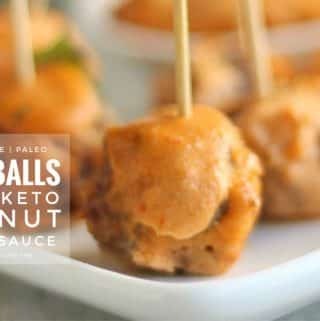 They’re Perfect for Watching the Big Game or for Summer Potlucks. 2. Slice the jalapeños in half. 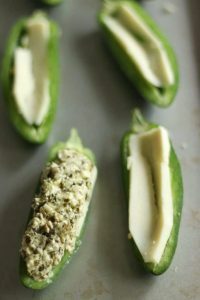 Remove the seeds, then place onto a baking sheet. Cut half of the mozzarella into 6 slices, then place onto each of the jalapeños. 3. In a mixing bowl, mix the cream cheese and the rest of the mozzarella (shredded). Add the pesto and mix until well combined. Divide the pesto and cheese mixture into 6, then place onto each of the jalapeños. 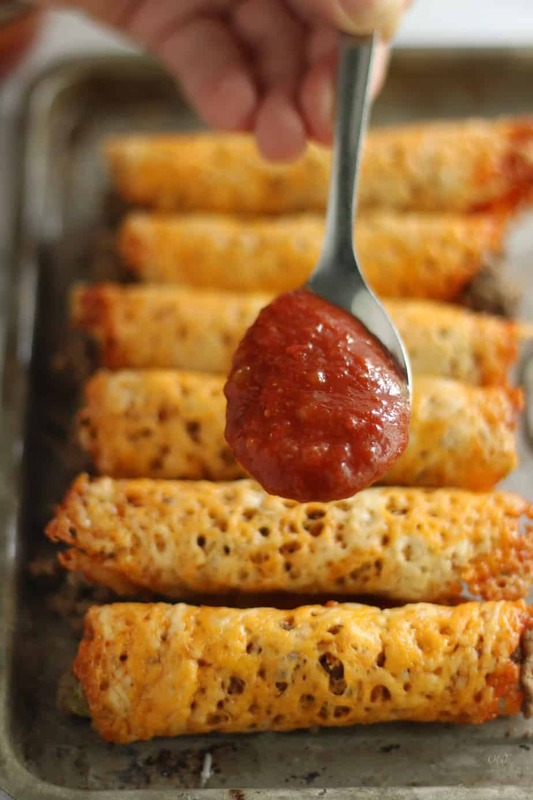 Bake for 12 – 15 minutes. 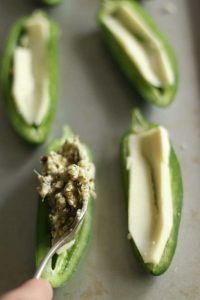 This recipe makes 6 Keto Pesto Poppers. Slice the jalapeños in half. 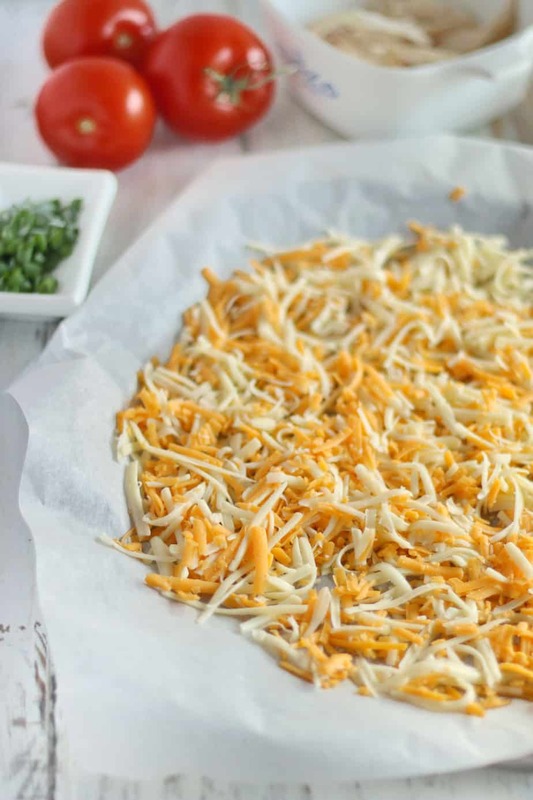 Remove the seeds, then place onto a baking sheet. 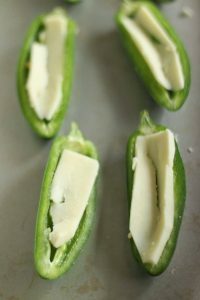 Cut half of the mozzarella into 6 slices, then place onto each of the jalapeños. 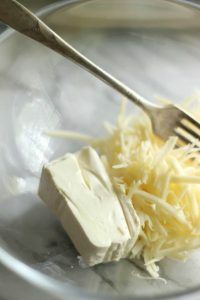 In a mixing bowl, mix the cream cheese and the rest of the mozzarella (shredded). Add the pesto and mix until well combined. 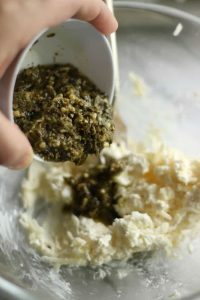 Divide the pesto and cheese mixture into 6, then place onto each of the jalapeños. 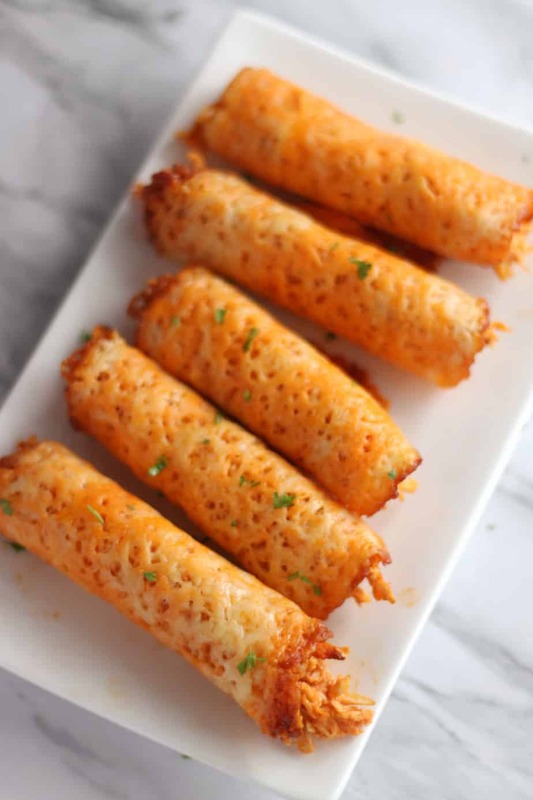 Bake for 12 - 15 minutes.